Years ago when I first moved to Namibia to start my PhD on the black-faced impala at the age of about 21, a couple of Aussies and a German who were working there at the Desert Research Foundation of Namibia adopted me and helped me find my feet in this unique desert land where I didn’t know a soul. The war vet invasions had just started in Zimbabwe, and, well, if you’ve read my first book “Dry Water” you’ll know the rest of the story! Over a decade later, two of my early rescuers, fellow Aussie Dr Julian Fennessy and his wife, German Steph Fennessy, are living in Windhoek and raising their two kids in Namibia whilst also working on giraffe conservation across the continent. Together Julian and Steph started and run the Giraffe Conservation Foundation, the world’s first and only organisation dedicated to giraffe conservation in the wild. Julian is a true giraffe guru. 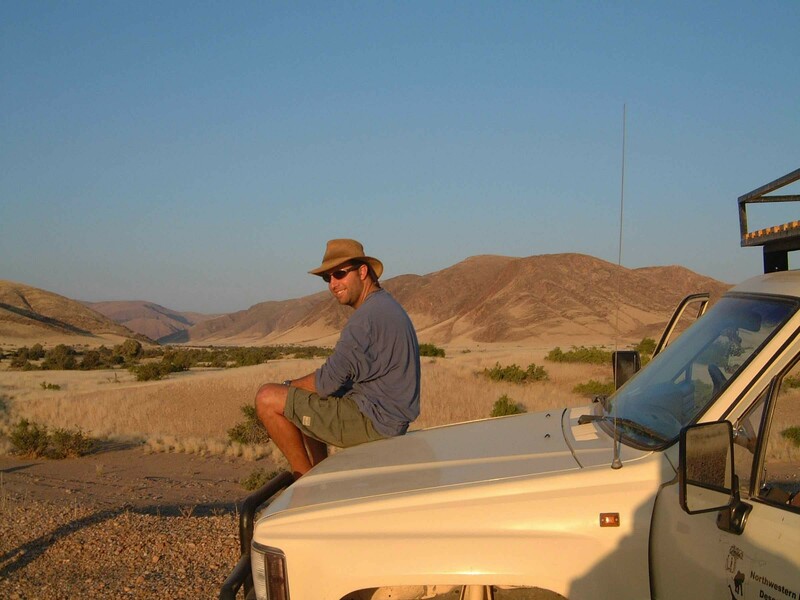 He is the founder and co-chair of the IUCN SSC Giraffe and Okapi Specialist Group and completed his PhD on Namibia’s desert-dwelling giraffes. 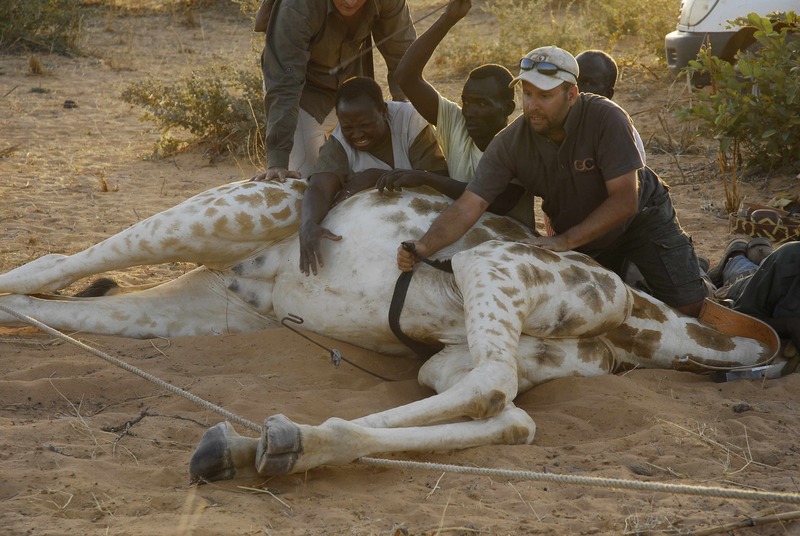 You won’t meet a couple more dedicated to the conservation of giraffes in the wild. There are few species more iconic and representative of Africa than giraffes, and I’ve seen them pretty much everywhere I’ve ever travelled in Africa, so why are folks like Julian and Steph worried about their future? How many species and subspecies of giraffes are there? And what countries are they found in? Does everyone not know this?! 😉 It is currently recogised that there is one species and nine subspecies (see our new poster online!). However, we have been undertaken an assessment of giraffe populations across the continent for the last decade and some fascinating results have come out. Giraffe are found in an arc from Niger in west Africa through Central and East Africa and south down to Namibia and South Africa. Whilst there range is relatively large, their habitat is increasingly shrinking reducing the possibility of them moving between populations. What is the status of giraffes in the wild? Should we be concerned about them becoming extinct? As a species, giraffe are currently listed as ‘Least Concern’ on the IUCN Red List – however, this is more as a result of no recent assessment being undertaken on them. 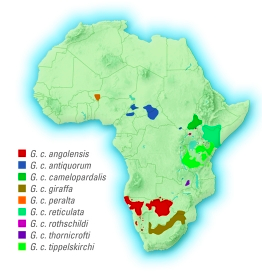 In 2008 and 2010 the West African (G. c. peralta) and Rothschild’s (G. c. rothschildi) subspecies of giraffe were listed as ‘Endangered’ – based on the work of GCF, and currently the species and all subspecies are being assessed by the Specialist Group – the first-ever detailed assessment for giraffe and we hope to complete this by early 2016. We obviously feel that giraffe need more attention locally and internationally as – and why? 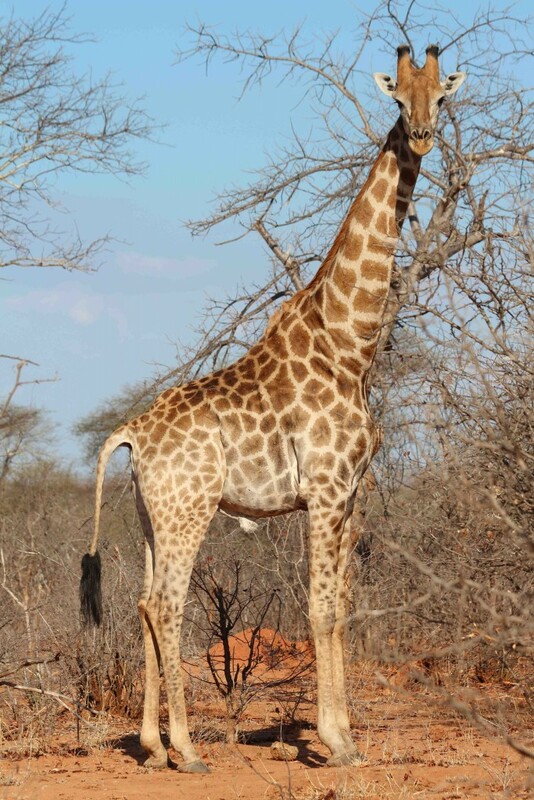 West African giraffe number less than 400 in the wild, Rothschild’s giraffe approx 1,100 and Kordofan giraffe less than 2,000 individuals. Few know that giraffe number less than 80,000 in the wild (less than 5 times the amount of African elephant) and have dropped greater than 40% in the last 15 years alone! Tell us more about the threats to giraffes and what can be done about them. 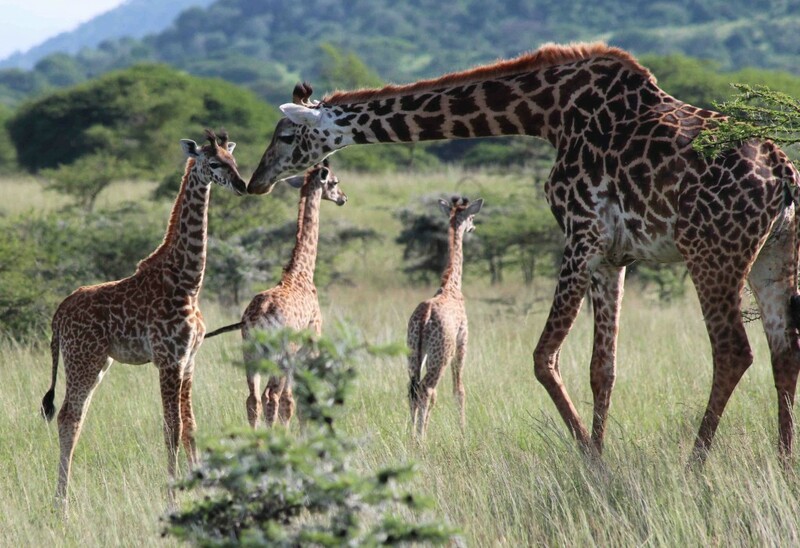 Specifically can you tell us what GCF is working on to conserve giraffes in the wild? When we set up GCF in 2009 we realised that no one was giving giraffe any real attention – the Forgotten Giant! Everyone assumed that giraffe are everywhere – and on some safaris it feels like that – however, the more and more we look into the situation the more precarious the situation is. The usual suspects – habitat loss and fragmentation, combined with human population growth and demand for increased resources and agricultural land is big. Combine this with illegal hunting (poaching) and giraffe are seriously being threatened across much of Central and northern East Africa. Over the last few years GCF realised it cannot do everything itself and as such has built (and keeps on doing so) a network of conservation partners across areas to help save giraffe. Whether it is supporting de-snaring initiatives and monitoring in Zambia or Uganda, assisting to draft the first-ever national giraffe strategies in Niger and Kenya, or understanding giraffe skin disease across the continent…and much more, GCF is looking at initiatives based on partnerships and collaborations – we can only truly find solutions by working together. What started your passion for giraffes? And what keeps you going now? 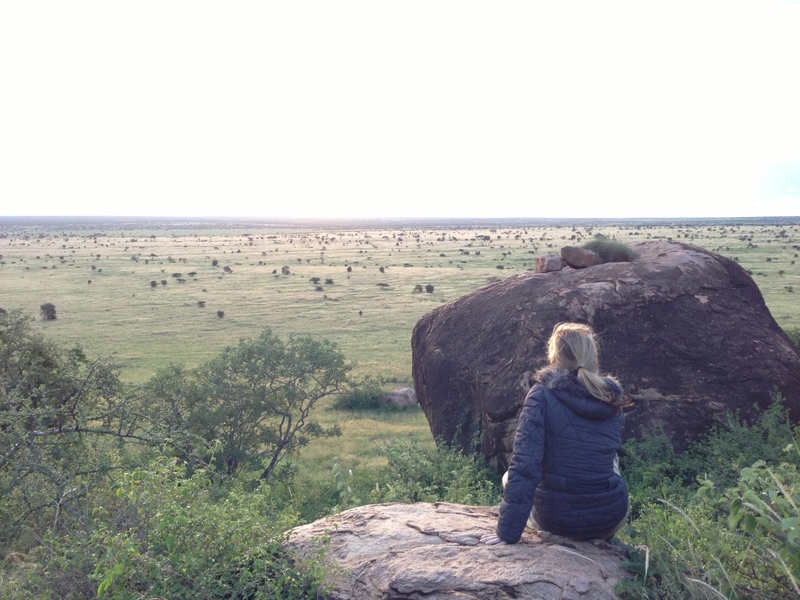 Working in north-west Namibia on a project looking at the interactions between people, water, livestock and wildlife, l was keen to become an elephant researcher – who wouldn’t?! 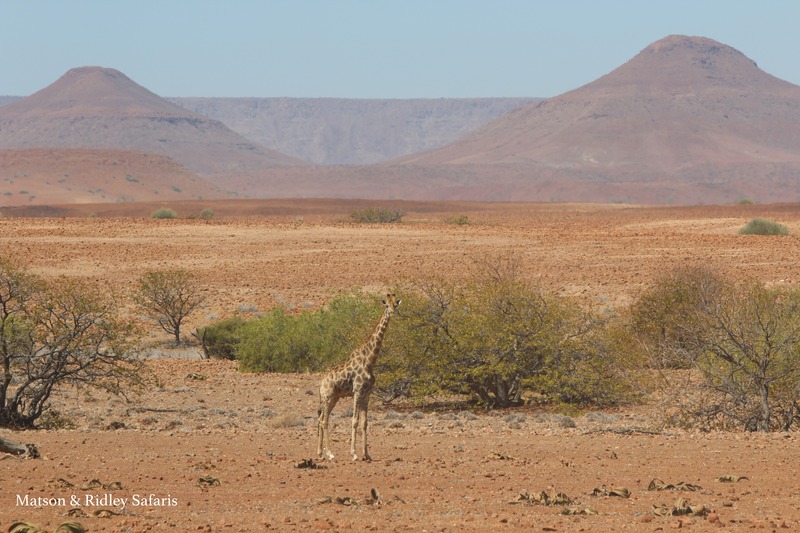 After looking at giraffe in the desert, walking up, down and around one of the most arid environments and in the oldest desert in the world – l was amazed to read the lack of work done on giraffe across the continent. Beyond surprising. So from there l thought l can’t be wrong and although l worked for the next 15 years, spare time and holidays spent dedicated to finding out more about giraffe, supporting government and NGO giraffe initiatives, and importantly sharing as much information as possible about giraffe to the world. What’s the most fascinating experience you’ve ever had with a giraffe? Or is there more than one?! Every experience with giraffe has been amazing. Planning and undertaking the first-ever GPS satellite collaring of giraffe in northwest Namibia was special whilst recently traveling to Garamba NP in the DRC to provide advice on how to save the last 30-40 giraffe in the country really emphasises why we all do conservation. Unfortunately l do not get to spend day-to-day close to giraffe like our zookeeper colleagues, but the knowledge that giraffe still live across the continent and in many areas in and amongst people is even more special than a personal experience. What can people do to help giraffe conservation in the wild? Of course people can go online and donate directly to help us save giraffe in the wild. As important, people can educate themselves more about the plight of giraffe – download our posters and booklets and find out everything you need to know about giraffe. If traveling to Africa you can look at volunteer options with GCF and its partners, or if going on a safari always book with an agency that directly supports giraffe conservation in the wild. Those lucky enough to be joining me on my safari to Namibia in September this year will get to spend some time with Julian as he’ll be meeting us in Windhoek and giving us a talk about giraffes and his work. 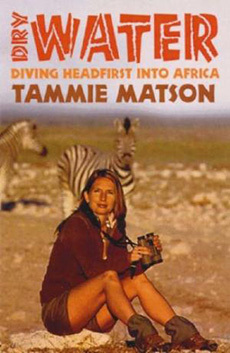 To register your interest in my conservation-focused safaris in Africa, please drop me a line here. 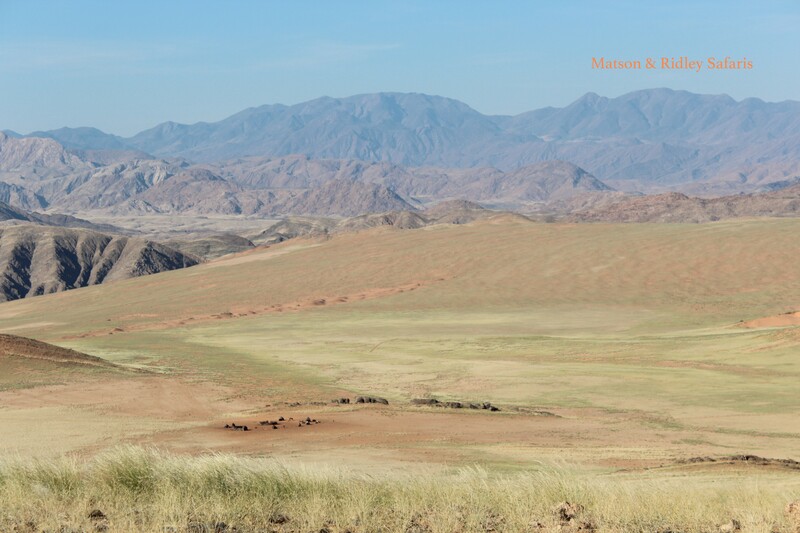 My 2015 Namibian safari is full, but I’m currently filling a safari for North West Namibia in May 2016 that includes these dramatic landscapes where Julian works, so contact me if you’d like to join. To make a donation to the important work of the Giraffe Conservation Foundation, click here. There are some parts of Africa that remove you so completely from reality that you start to wonder whether all that stuff that fills your life with worries in the ‘outside’ world really matters much. Serra Cafema Camp, in the Marienfluss Conservancy, is such a place, where traditional Himba people still live a life that is much like what it was several hundred years ago, where a river teeming with crocodiles slices through gothic mountains surrounded by sand dunes, where you can really find yourself by losing yourself in landscapes so primitive you can’t help but feel humbled. There’s no phone range or wifi up here so you can leave all that behind. And you know what – you probably won’t miss it one bit. It’s all about disconnecting to reconnect, as Wilderness Safaris puts it. This is the ultimate escape and a huge adventure. Here’s my photos of one of my favourite parts of truly wild Africa, our escape to the most remote part of the land that God forgot, as promised in last week’s blog. The road to ‘never never’ in the land that God forgot…. It takes several hours in a light plane to get to Serra Cafema from Namibia’s capital city, Windhoek, and then another hour or so to get to the camp itself. 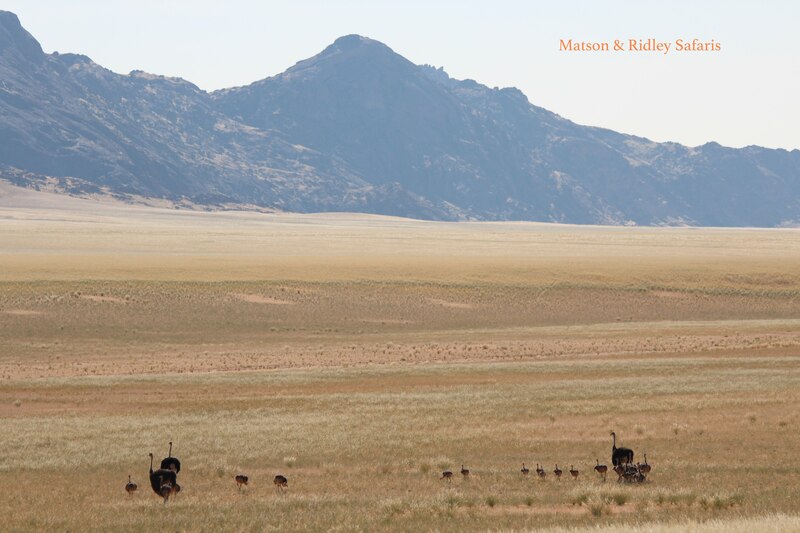 They don’t call it the most remote camp in southern Africa for no reason. But it’s worth it. You can’t imagine what it feels like to be in this primeval place with all that space around you without actually going somewhere like this. It’s like taking a step back in time and the colours are simply breath-taking. One of the best things about Cafema is that you can walk to your heart’s delight. Here’s one of our group members, Tristan, on a dawn walk in the dunes up behind camp. There used to be lions and elephants and even rhinos in north west Namibia, but the war up until 1990 when Namibia achieved Independence, wiped them all out. It would be incredible to see these species coming back and with the right ongoing management that is possible. Now the species you’re most likely to see in this region are springbok, oryx and ostriches, and for the lucky ones there are also endangered Hartmanns mountain zebras, with their distinctive thin black and white stripes without any shadow stripes. Predators like brown hyaenas and jackals live here too, as testified by their tracks in the sand near camp. This is the view of the Kunene River that you get on the deck of the main area at Serra Cafema Camp. The luxurious camp is nestled under big shady Ana and Acacia trees and is truly an oasis in the middle of nowhere. You walk to your room along wooden walk ways on stilts. That’s Angola across the river, the Kunene marking the boundary. All day and night you can hear the rapids upstream. The contrast of being in the desert dunes so far from any kind of civilisation with this rushing river that originates in the highlands of central Angola and floods out through the Skeleton Coast to the Atlantic Ocean is mind blowing. But above all, it’s incredibly relaxing. 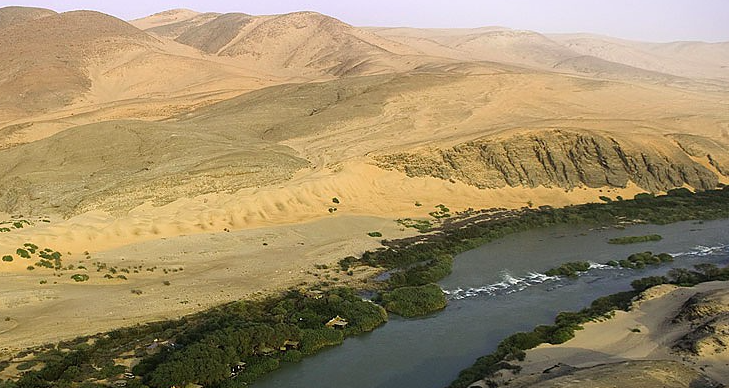 A swim in this river is not recommended, and you’ll see why if you scroll down…. 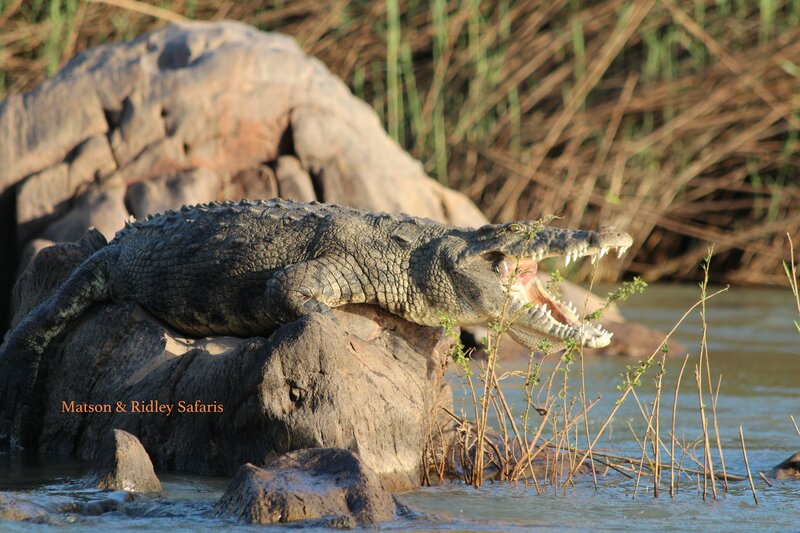 Nile crocodile, sun bathing…. One of the most fun activities at Cafema is an afternoon boat ride up the Kunene River, where you have a good chance to see crocs like this guy sunning in the late afternoon, and abundant bird life. Just before the sun sets the guides pull up at a sand bank on the Angolan side and lay out sun downers fit for kings and queens. It’s a really tough life! The ‘3 Ozzies’, Joanne, Maggie and Leonie, watching the rest of our group in the other vehicle come down the dunes on the drive into camp. There are some adrenaline rushes as the 4x4s slide down certain roads on steep dunes, which of course the guides do all the time, but the first time you do it you really wonder if you’re going to survive! It hadn’t rained in this area for about 5 years, according to our guides, and then 3 months before our visit, the heavens smiled and granted the Hartmanns Valley a generous serve of much needed rain. The result was incredible scenes like this where usually there is only sand, now valleys filled with grass. These ostriches were clearly still celebrating with a large flock of youngsters, taking advantage of the good times to reproduce. 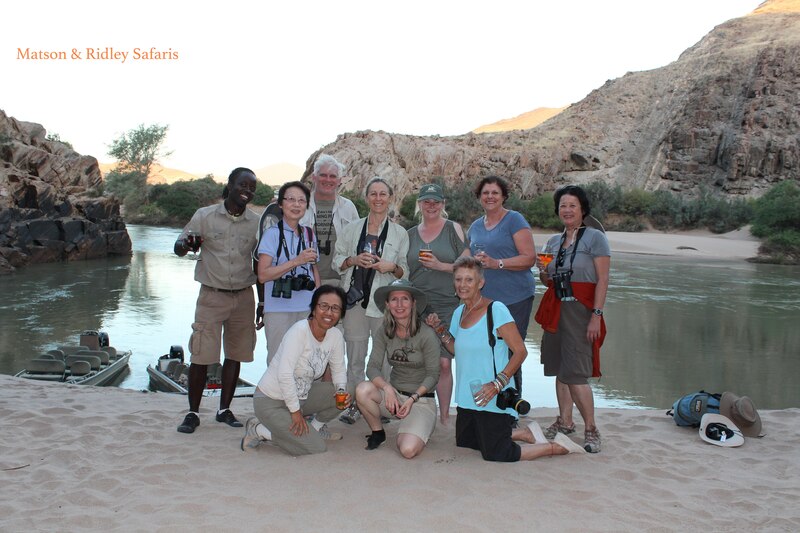 Here we all are having sundowners on the Kunene River with one of our Himba guides, Timo – on the Angolan side without a passport! Back row: Timo, Patricia, Tristan, Carina, Joanne, Leonie, Helen. Front: Chuan Fong, me and Maggie. Of course, probably the most special part of the Serra Cafema experience is meeting the Himbas. The Himbas are in a joint venture partnership between Wilderness Safaris who operate the camp and the Marienfluss Conservancy, owned and run by the local people. Our guide Stanley described his people, the Himbas as one of the ‘richest’ tribes in Africa because they have so many cattle. Cattle are the currency in many parts of Africa, used in dowries for marriage and many other exchanges. The Himbas are excellent cattle farmers, semi-nomadic people who move with their cattle to better grazing as needed. 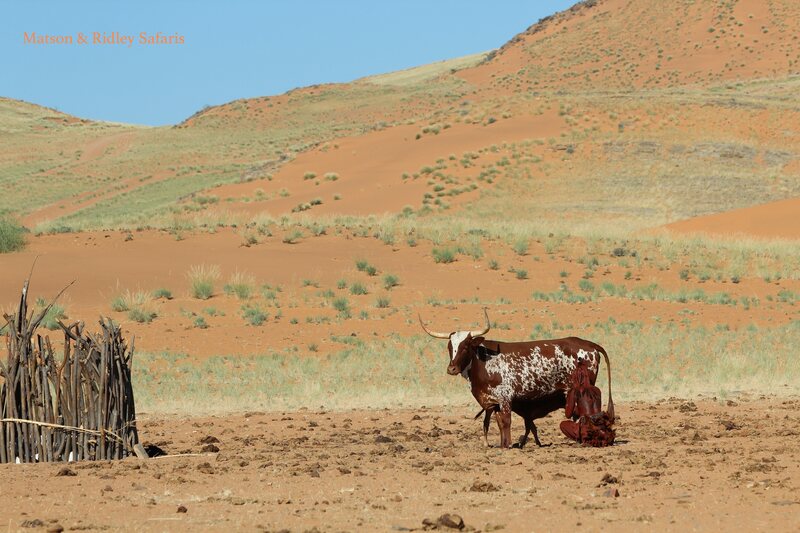 I’ve seen this part of Namibia much drier than this and sometimes it’s hard to believe any cow would get a meal out of the amount of vegetation available. They live on milk from the cows and occasionally meat from a goat, trading to get pap (porridge made from ground corn or mealie meal), but they eat very little in the way of vegetables/fruit. Yet superficially they seemed very healthy to us and no doubt the rains brought great rejoicing in this part of the world. Interacting with the Himbas is really special and definitely a highlight of the visit. Here Maggie has a chat to a little Himba boy who clearly seemed to be enjoying the one-on-one, as mum watched on beside him with her young baby. 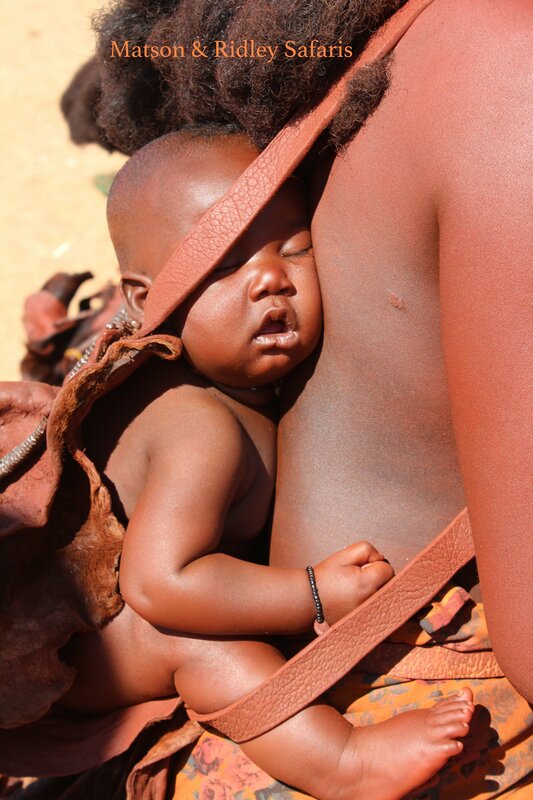 I’ve always loved watching the Himba women with their small babies. The look on the mother’s face above makes you think she could be any mother in the world. The ‘midwife’ who helps the women give birth is the old grandmother in the village. There are no medical doctors or hospitals out here. 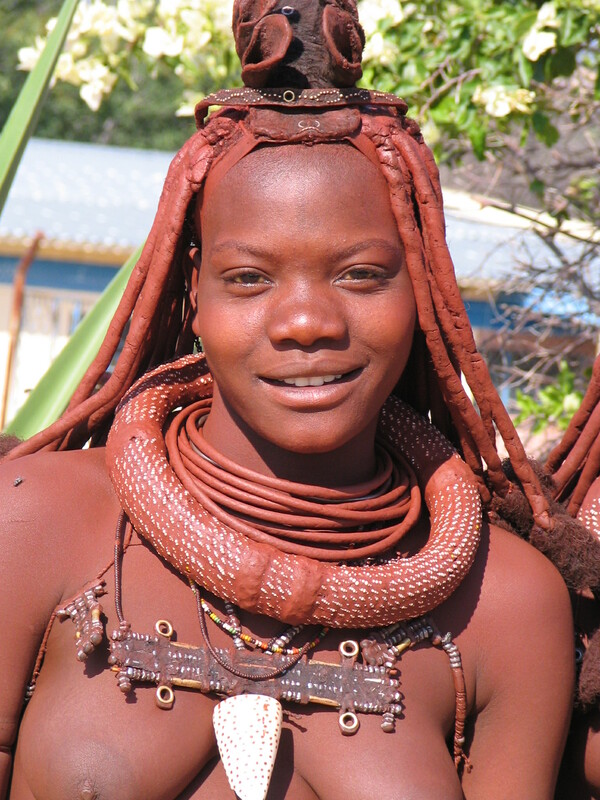 Women in Himba culture wear a special head dress if they are married. The red ochre that they cover their bodies with acts as a sunscreen and a moisturiser, but it’s also there for beautification purposes. 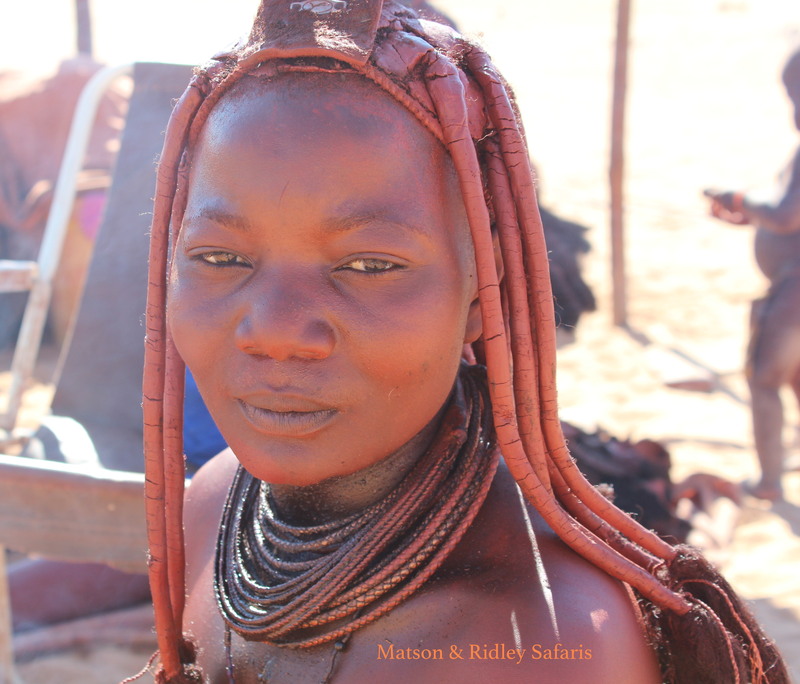 Himba society is polygamous; men can have several wives. Let’s just say feminism hasn’t hit Himba society yet and I don’t think it will for a while! Some of the kids now go to school, but not all of them. It’s easy to see how going to school could bring conflicts into the lives of these very traditional people, even though it’s important that they are represented and have their say in the country where they are a minority population-wise. Education is essential for this but it doesn’t come without challenges. One of our guides, Stanley explained how he had been educated at a Christian school and this had created a conflict in him. Now that he believed in the bible because of his school, he explained, it was hard for him to feel okay with the Himba worship of the ancestors in the ancestral fire. The two didn’t go together well. It was explained to us that the Himbas believe that when you die, you go into the ancestral fire and you are still ‘there’ with the people, accessible through the fire, but not really gone. I’m not sure I’ve got that 100% right, but it’s certainly not a philosophy that sits too easily with Christianity. So I could see how bringing in modern ways of thinking from the outside world would be seen as a threat to Himba culture and tradition. As soon as she strapped him onto her back, this baby fell right asleep. Mum resumed her work as if he wasn’t even there! 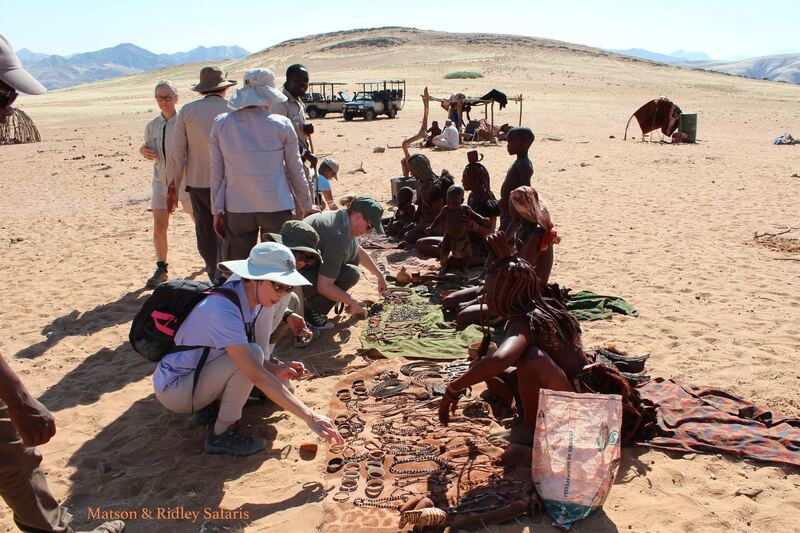 The Himba women seemed thrilled to be able to sell some of their jewellery to our group. I think we made a good contribution to their small businesses! 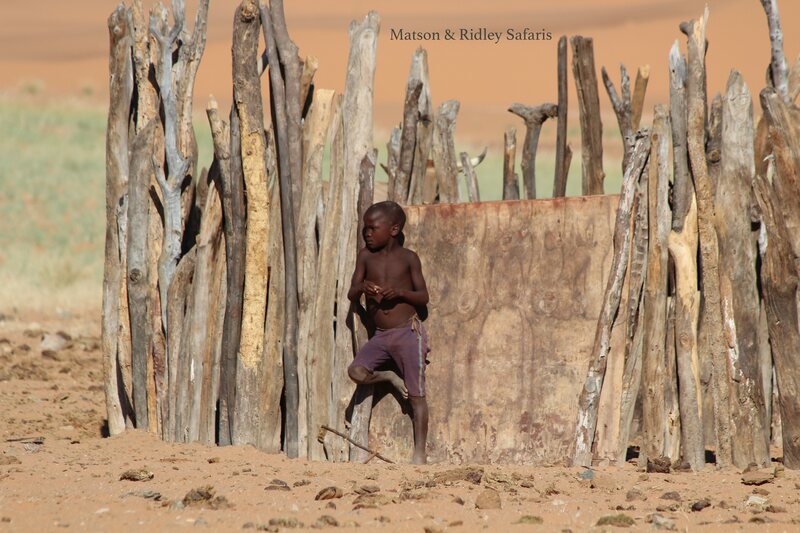 In the foreground in this picture you can see the Himba village. If only our own cities were as unobstructive in the landscape as theirs! That’s the hills of Angola in the background. 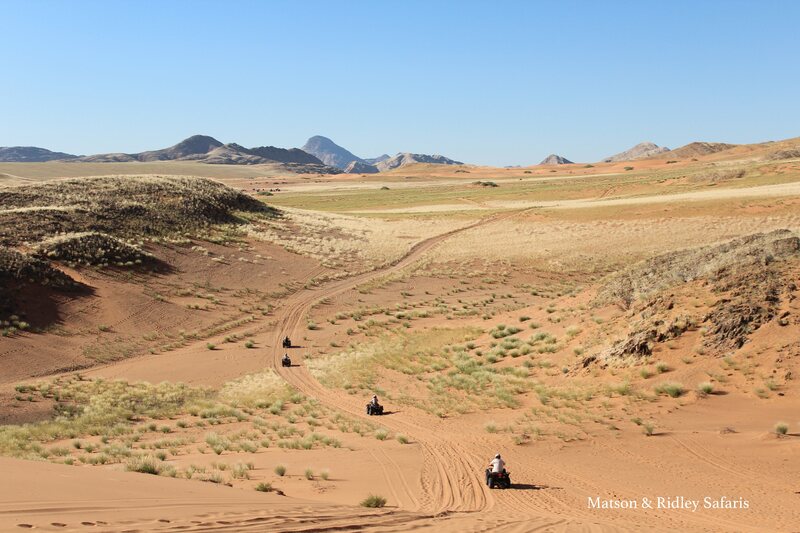 One of the fun adventure activities you can do at Cafema is hop on a quad bike and explore the landscapes from behind the wheel of your very own crazy demon 4×4. Here’s Helen just as we were about to take off. For some of my group, this was the first time on a quad bike. They are easy to use and don’t take long to get the hang of. It’s an awesome way to explore the area, and a whole lot of fun too! 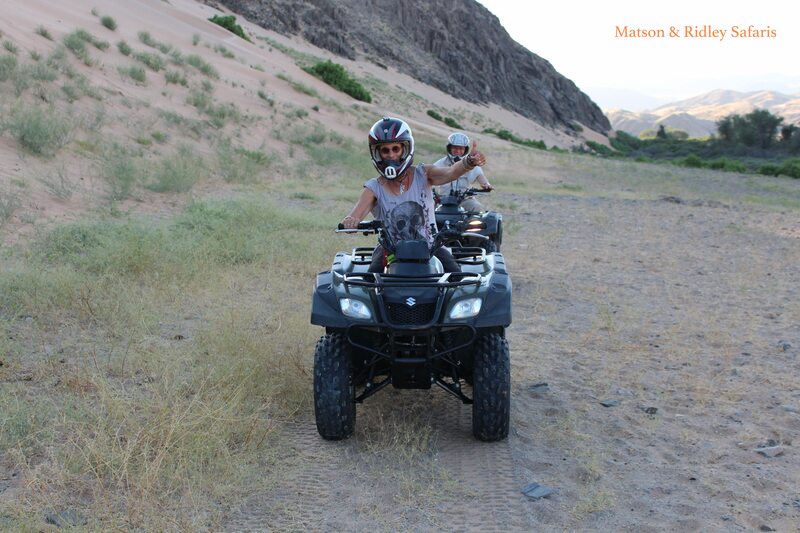 Maggie in front and Tristan behind on the quad bikes – looking like pros! On the last morning, after a special request from Helen, those of us who wanted to were able to quad bike our way all the way to the airstrip. What a thrill this was! One of the most incredible things was watching hundreds of springboks congregated on the plains running through the grass as we drove by. Absolutely unforgettable. 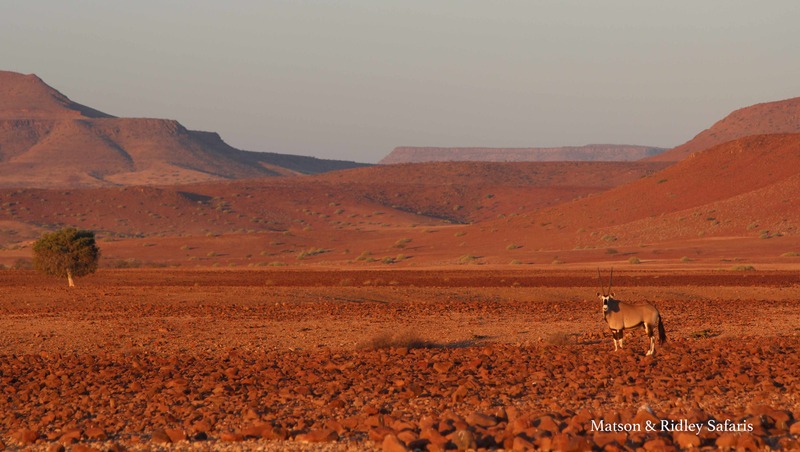 It had been a few years since I’d been back to Namibia, the desert land where I studied black-faced impalas for my PhD, later planning a reintroduction for the subspecies to their historic range in the far north west. 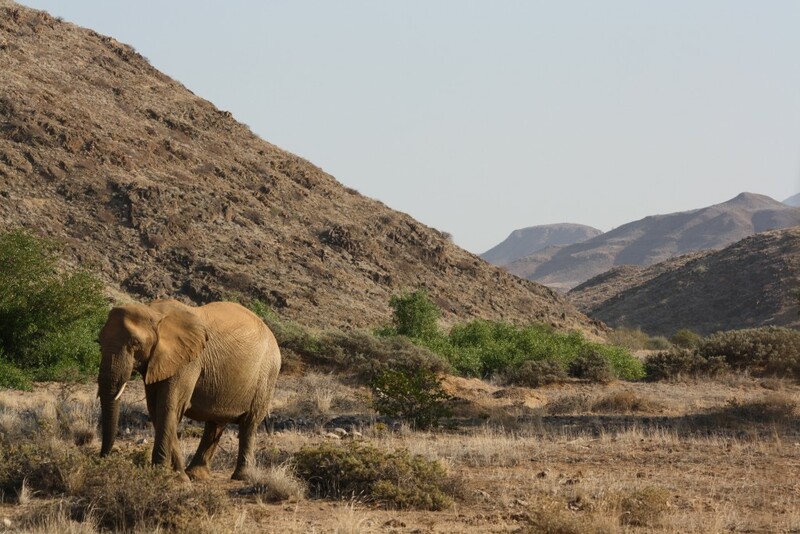 Namibia is also where I went on to start my work on elephants, working with the San Bushmen in Nyae Nyae Conservancy to help alleviate human-elephant conflict over water. Namibia will always have a special place in my heart, and it gave me a great grounding in the how-to of practical conservation. It’s also a great place to go on safari, being easy and safe by African standards, and having the most astounding landscapes, fascinating cultures and unique wildlife, unlike anywhere else. 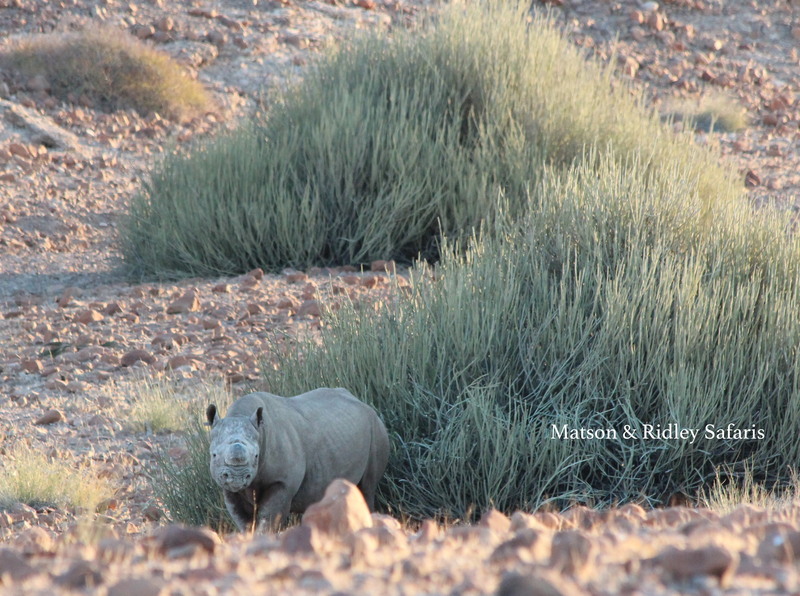 Oryx in Palmwag, Damaraland, near Desert Rhino Camp, a ecotourism partnership between Wilderness Safaris and Save The Rhino Trust, that also benefits 3 local communities. I believe Namibia is one of the best countries in the world in terms of innovative, practical conservation, largely because of their highly successful community-based conservation efforts, centred around the communal conservancies. There’s no better place to visit than camps like Doro !Nawas Camp, Damaraland Camp, Serra Cafema Camp and Desert Rhino Camp, if you want to see how engaged local communities get when they have genuine ownership over their natural resources. It’s not only the fact that you have locals running these camps, as managers, waiters and guides – it’s the warm feeling you get from the staff, who are not just employees but owners and landlords. I had a fantastic group of people on safari with me this time, mostly expats from Singapore of Dutch, Indian and American backgrounds, as well as a representative Aussie and a Kenyan! They were all up for an adventure, and that’s certainly what Namibia provides. 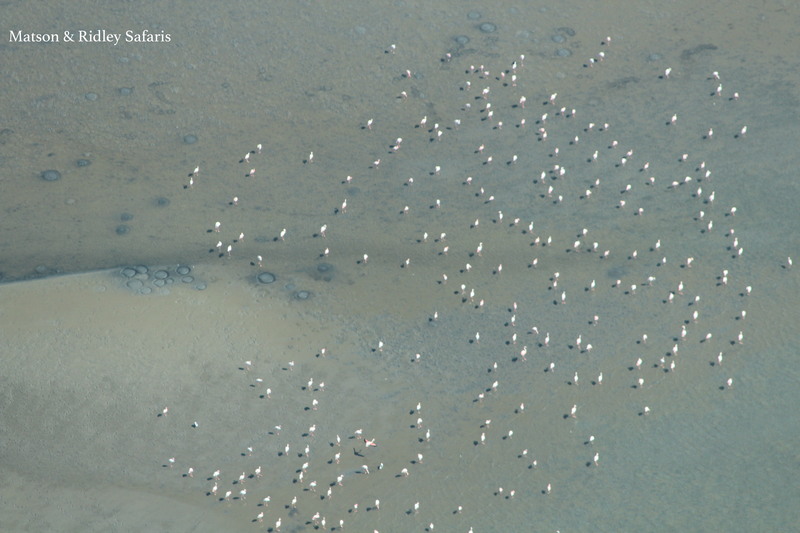 Flying over the vast landscapes is half the experience, seeing the dune shapes from the air and if you’re lucky, seeing flamingoes and seals along the coast! 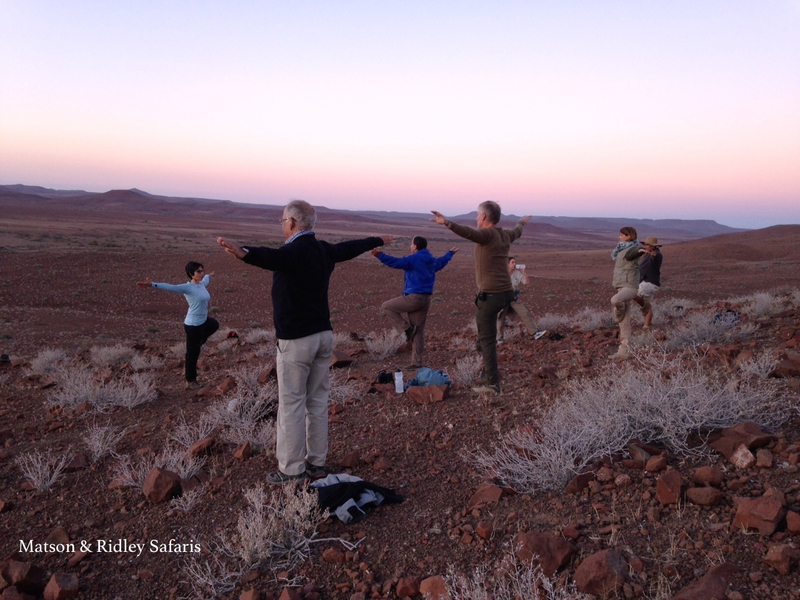 We kicked off the safari at Kulala Desert Lodge, the closest camp to the famous Sossusvlei area in the Namib Naukluft Park. I was delighted to find that my research assistant, Munekamba (now known as Ati-Sari), who helped me on my black-faced impala studies in north-west Namibia, is now the manager at Kulala Desert Lodge. If you’ve read my second book “Elephant Dance” you’ll remember the story of the two bull elephants standing over my tent while my assistant looked on from his roof top tent – well, that was Munekamba! After we worked together I introduced him to the managers at one of the Wilderness Safaris camps, and he’s done so well that he’s now managing one of their busiest camps. I’m stoked to say Munekamba saw his first elephant with me back in 2006 – and it was standing over my tent at the time! 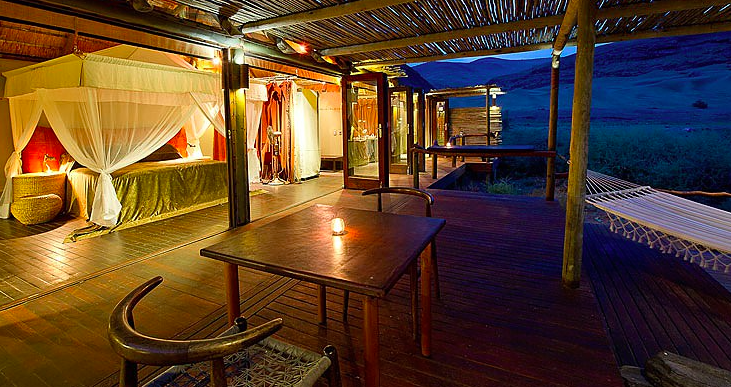 Kulala Desert Lodge is a great place to explore the Namib from. If you want, you can actually sleep on the roofs of the gorgeous chalets, star gazing from your bed as you drift off to sleep, however it wasn’t the best night for it for one of my group, Robert, as during the night a sand storm blew in and he had to make a quick departure inside! It was a wild morning in the dunes, as the more adventurous among us climbed the dunes, being literally blown right off their feet as cyclonic winds whipped across the desiccated landscape. At Dead Vlei however, it was perfectly calm, somehow protected from the winds by its sunken position. 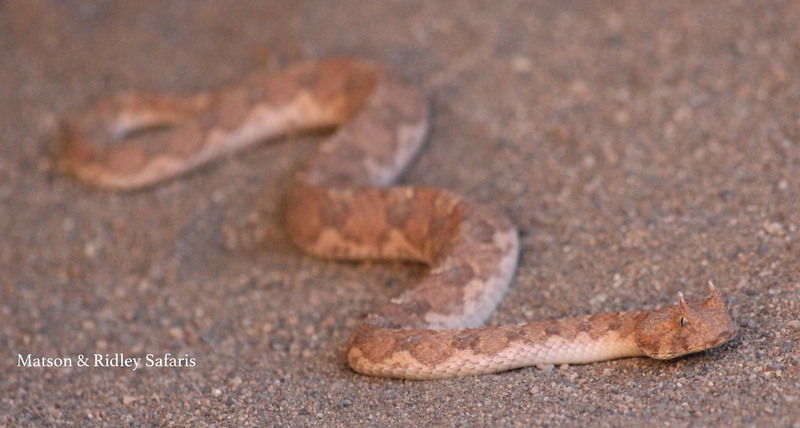 We discovered several fascinating species in the Namib, including the white lady spider and a horned adder at Sesreim Canyon, plus a wonderful spotted eagle owl in a tree near where we stopped for coffee, all well spotted by our excellent Wilderness Safaris guides. 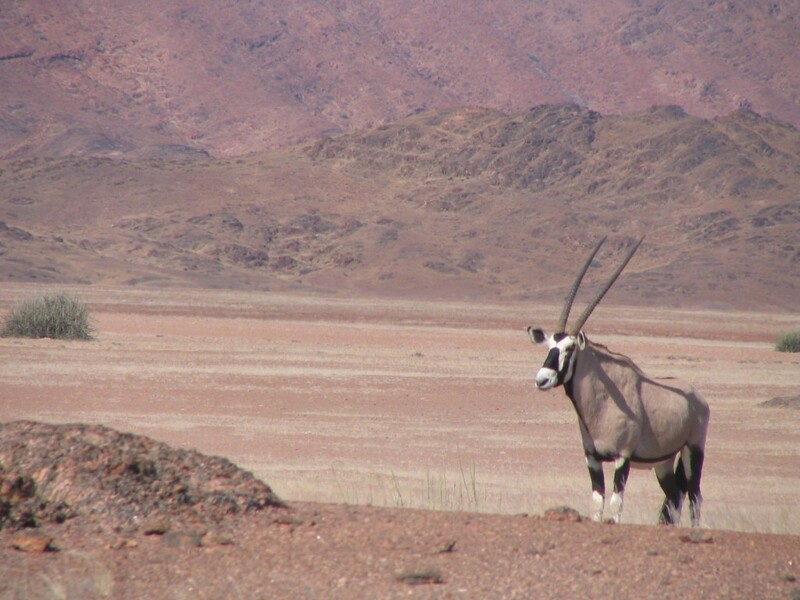 But to me it’s always the oryx that steal the show in the Namib, these magnificent antelopes with their black and white markings and sharp, straight horns that make them stand out so strikingly against the pastel colours of the mountains. 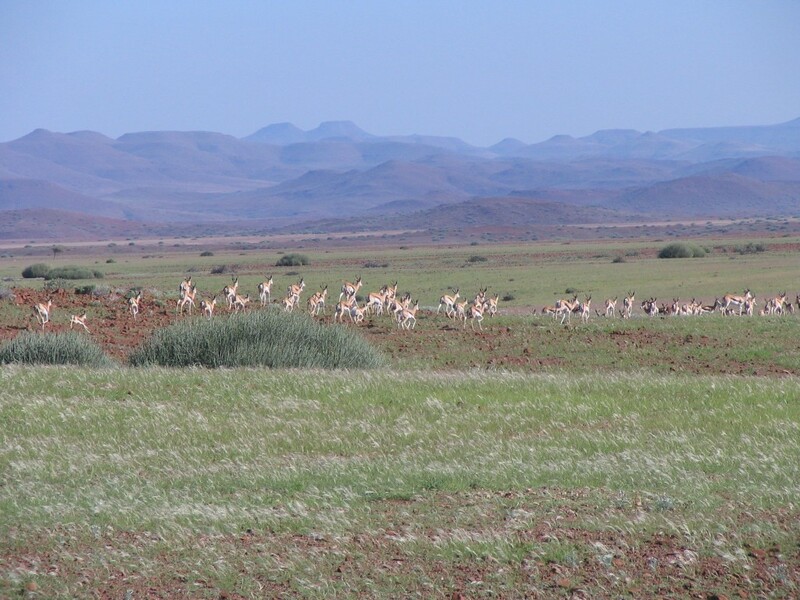 Then it was off to Desert Rhino Camp at Palmwag in Damaraland, a place of incredible red, rocky, mountainous landscapes, and home of rare black rhinos who munch on toxic milk bushes (Euphorbia damarana), springbok and oryx, kudu and many more desert- adapted creatures. 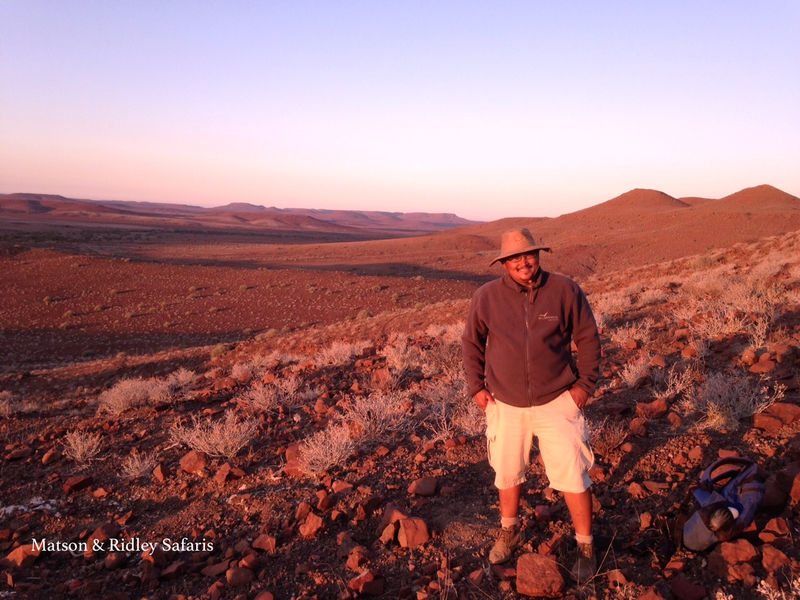 If the Namib is like landing on the moon, then Damaraland is like going to Mars. 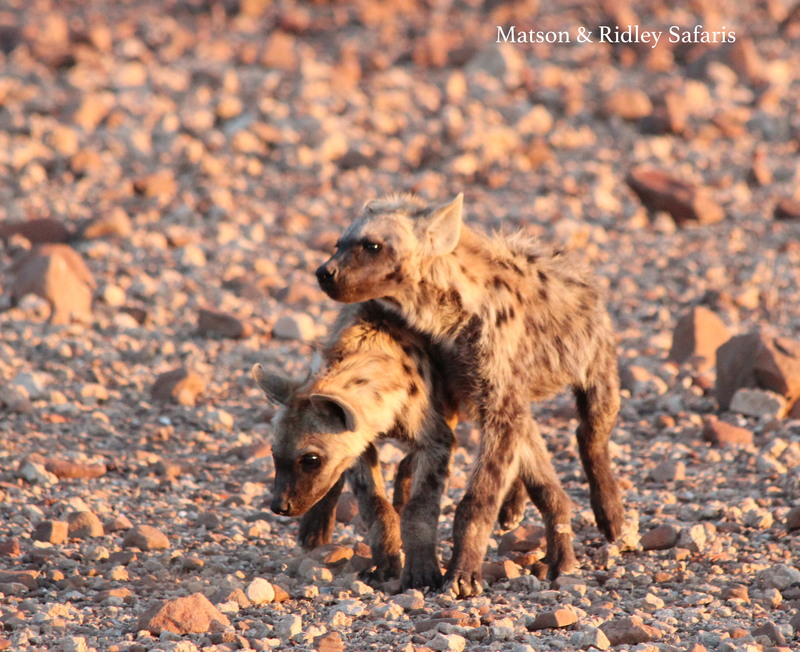 Here were were lucky enough to experience spotted hyaenas at a den, including two very young ones who walked right up to our vehicles with not a care in the world. We joined the Save The Rhino Trust trackers on a walk to see a black rhino they had found earlier that morning, a bull known as “Don’t Worry”, who had been dehorned as part of a Ministry of Environment and Tourism initiative to reduce poaching in Damaraland. It never feels right to me to see a rhino without its horn, and I worry about the ability of the rhinos to defend their young against lions and conduct normal behaviours without this natural appendage. Sadly, there is evidence that poachers will still kill dehorned rhinos for the small amount of horn left below the skin, because of its high value on the illegal market in Vietnam. There was lots of discussion around the campfire about rhino conservation, and a recurrent theme was the issue of legalising the trade in rhino horn, which seemed to be a popular idea among all the Namibian wardens, guides and rangers I spoke to. Many people in Namibia feel that they should be benefiting from the horns, not the criminals involved in the trade, or that the sales of horn could support rhino conservation. While this makes sense to me, I can’t imagine how wild rhinos, with such low populations today, and continuing to decline at 1000+ per year, could sustain a market in Vietnam, with its growing population of 93 million+ and increasing wealth. In Africa, a single horn can fetch three year’s worth of a local person’s monthly salary, so there are very real incentives for good guys to sacrifice conservation for economic motivation. We have to continue to support anti-poaching efforts in Africa, but I’m more convinced than ever that reducing demand in Vietnam is the most effective weapon we have to stop the slaughter. That’s why I think awareness campaigns in Vietnam (like Breaking the Brand) need much greater support, targeting the elite audience who are buying it. This battle cannot be won in Africa alone. Desert Rhino Camp is a partnership between Wilderness Safaris and both Save The Rhino Trust and 3 Damara communities surrounding the Palmwag concession. Going there is truly supporting conservation because what you pay to visit directly supports the 3 communities and pays for the trackers to protect the rhino every day in the concession. I love examples of genuine community-based conservation like this, based on sound economic principles. And quite besides the feel good factor of going there and knowing the contribution you’re making makes a real difference, which the staff remind you about all the time by thanking you at least three times a day, the feeling in this camp is just magical. The staff sing and dance every night (and boy, have they got rhythm! ), and on our last night they arranged a surprise starlit dinner out in the bush, something that me and my group will never forget. It was the highlight of our Namibian journey. 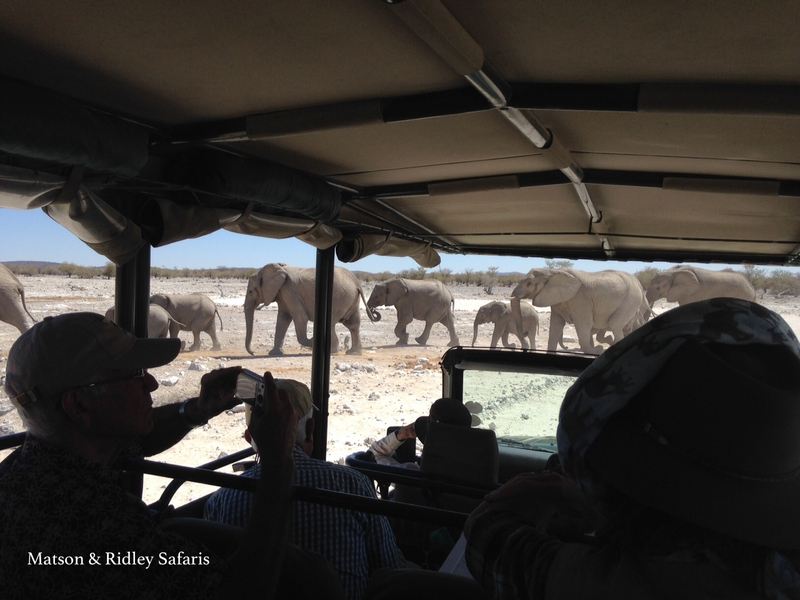 Finally it was off to see some big animals up close at the Ongava Game Reserve, right next to Etosha National Park. For me this is really home territory as I was based there for two years in a battered old caravan at Okaukeujo research camp while collecting data on black-faced impalas for my PhD. This part of the world is really fantastic in terms of wildlife in September, the dry season, because you get the big concentrations of animals at the waterholes, and on this front it didn’t disappoint. 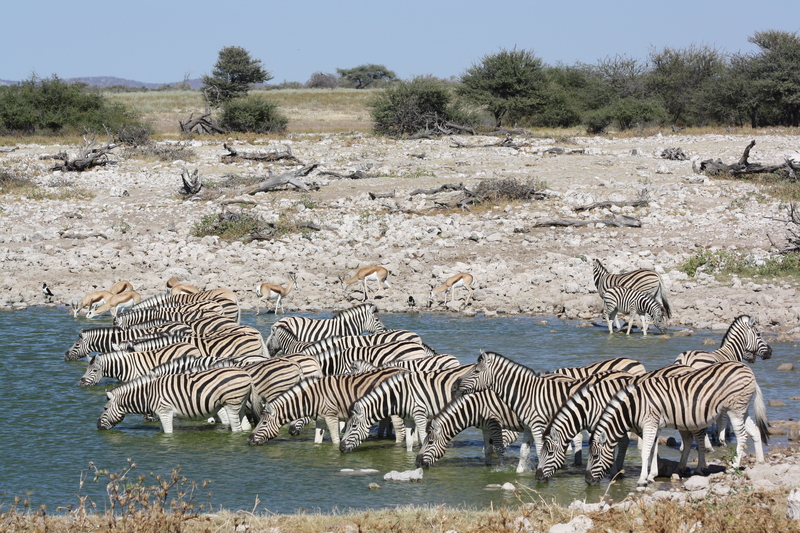 You can simply sit at a waterhole for hours in Etosha at this time of year, just watching the hundreds of animals come and go. 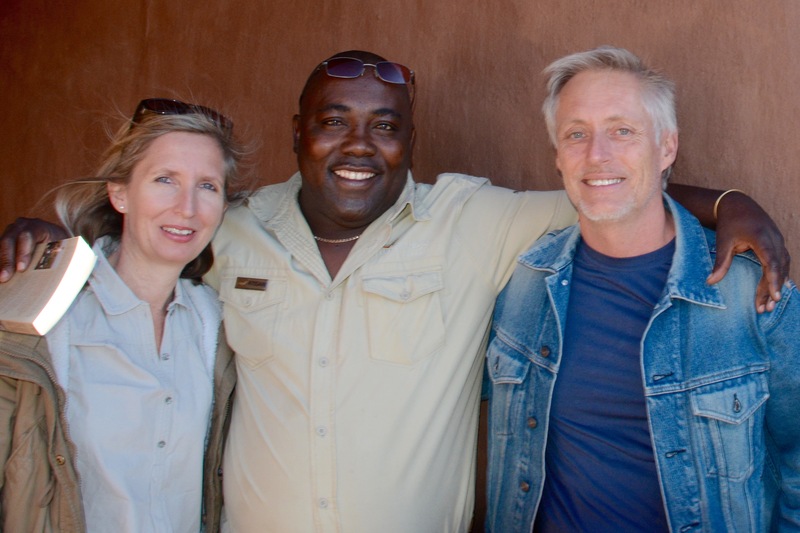 We also spent some time with mating lions in Etosha, walked up to white rhinos at Ongava and shared a cup of coffee at Okaukeujo waterhole with my old friends, Shayne Kotting (MET warden, Okaukeujo) and Birgit Kotting (MET, head of the rhino custodianship program). I’d like to thank Dr Julian Fennessy of the Giraffe Conservation Foundation for giving us a talk on the plight of Africa’s giraffes on our first night in Windhoek and for joining us for a fun night at Joe’s Beerhouse afterwards. Julian really opened our eyes about the increasingly worrying state of Africa’s giraffe subspecies, and watch the IUCN red list this year which is likely to suggest that quite a few giraffe species are more endangered than we realised. Thanks also to Abigail Guerier at Ongava Research Centre for the fascinating talk at Ongava on our last day on her work on the genetics of white rhinos. Fascinating to learn about the complex life histories of these prehistoric giants. Let’s just hope they are around for our children to see! Finally, a very big thanks to Susan van der Vloodt, who brought most of her family and friends along on this magical journey. There’s nothing like sharing an African experience with the ones you love, and for me it’s a real privilege to share Africa with others who love being there as much as I do! 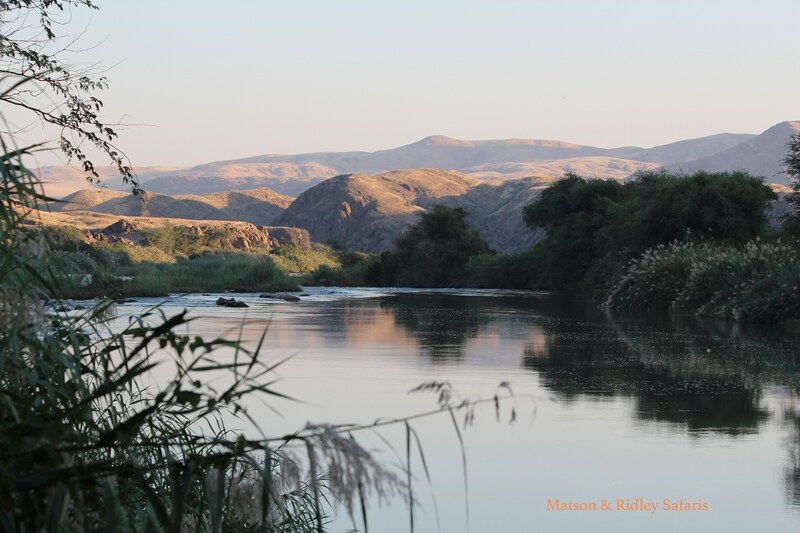 To see more photos from our Namibian journey, you can like our Matson & Ridley Safaris Facebook page by clicking here and pressing ‘like’. Are you male? Are you a lone traveller? Do you know someone who is and wants to go to Namibia? Well this is your lucky day! This is a last minute offer for a single male to join my Namibian safari THIS September (1st-8th), sharing with another single male. Yes that’s just a few months away! The price of this amazing safari, including the beautiful Kulala Desert Lodge in the Namib Desert, Desert Rhino Camp in Damaraland and Ongava Lodge next to the famous Etosha National Park, is usually SGD$8555, but this one remaining spot is going for a discount at just SGD$8000 (approx AUD$8000 or USD$6000) at today’s exchange rate. Sorry ladies, this spot is for a bloke only as he’ll be sharing with another bloke (a very nice one!). First in best dressed so get in touch with me now by clicking here! For full details of the safari click here. Who’s Coming to the Skeleton Coast with Me? Last year, Hoanib Skeleton Coast Camp won Tatler’s “Most Out Of This World” award. I reckon it would have been a tough choice for this between Hoanib Camp and Serra Cafema, two of the most remote and wild-feeling places you’re ever likely to visit, both of them run by Wilderness Safaris. That’s why my May 2016 safari focuses on these very two camps. Because I reckon they’re both awesome and, frankly, I want to go back there! I want you to feel the magic of Namibia’s wild spaces with me and go home feeling like you’ve just touched the moon. The truth is, in the modern world there’s not many places you can go where you are truly away from it all, hundreds of kilometres from civilisation and the things that own us (television, smart phones, meetings, commuting…). You won’t get a better escape than among the desert-dwelling animals and plants of Namibia’s North West region. Right now I’m recruiting for my safari there in May next year (2016), which is already half full (up to a maximum of 12). Read on if you’d like to know more and get in touch with me here to sign up. 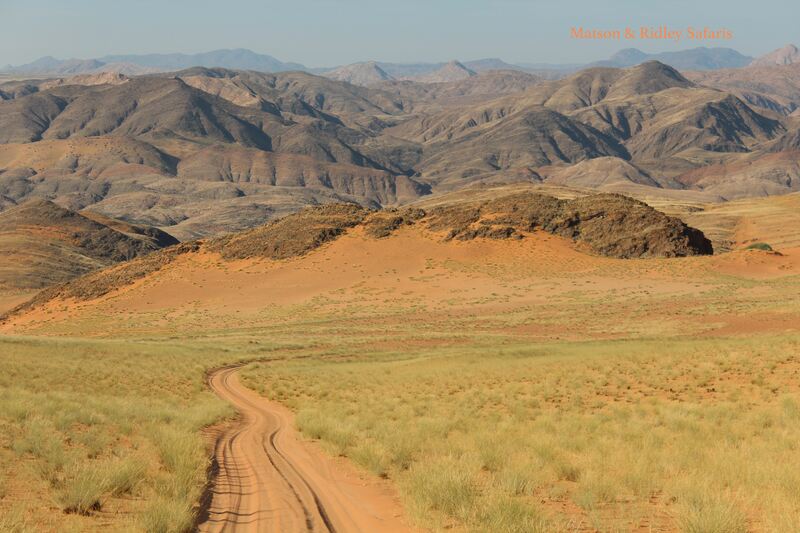 If you’ve never experienced Namibia’s north west then you’ve got something special to look forward to! 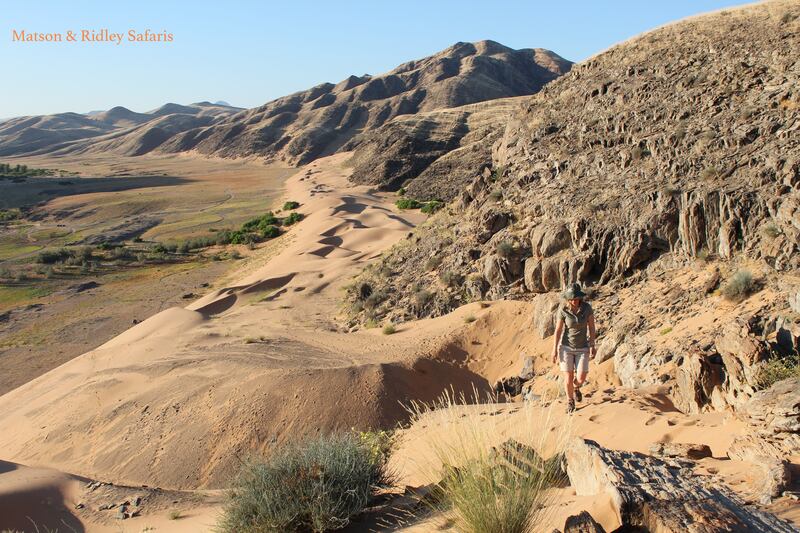 If you’ve ever dreamed of visiting the spectacular Skeleton Coast, meeting Namibia’s traditional Himba people, and spending time with desert dwelling elephants and lions in an environment that is wild, remote and pure adventure, then this is the safari for you. 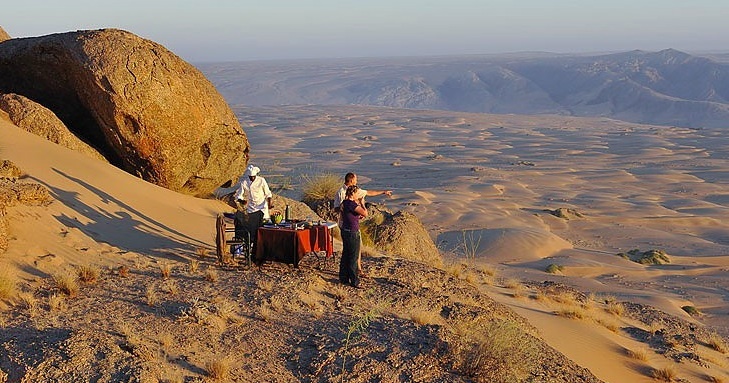 This luxury, conservation-focused safari kicks off on 20th May in Windhoek with a night at the Kalahari Sands Hotel, and then we’re off the next day by plane to Hoanib Skeleton Coast Camp for 3 nights. 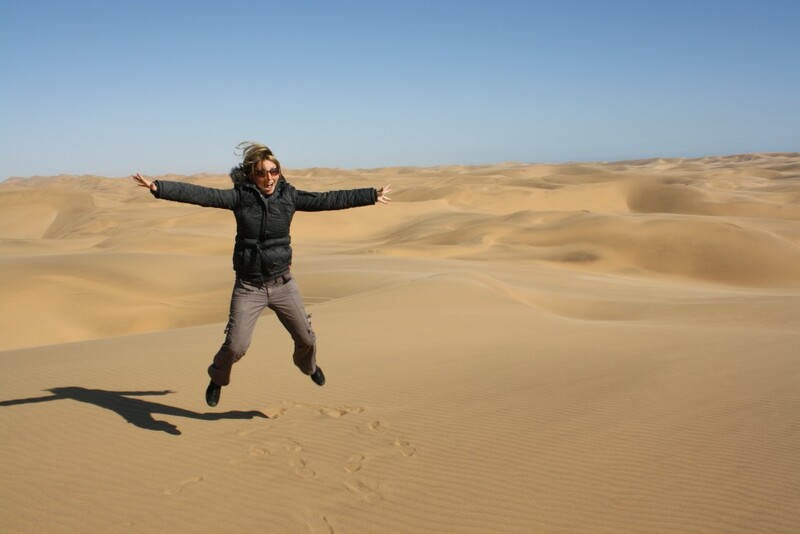 On our second day, we’ll do a full day fly-in excursion to the Skeleton Coast itself, where we’ll see shipwrecks, desert dunes, seals and so much more. I’ll spend time telling you about the behaviour and ecological functions of the elephants and other species in this unique, fragile region. On 24th May, we’ll fly to Africa’s most remote and my favourite camp, Serra Cafema and spend 3 amazing nights there. I don’t know how to describe this luxurious camp – it’s so much more than an oasis in the desert. You just have to see it to believe it. 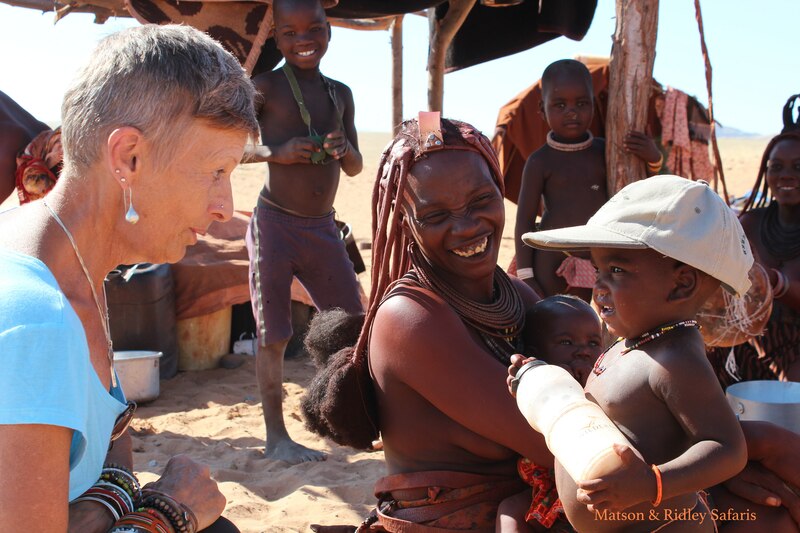 A community partnership with the local Himba community is one of the unique features, meaning it really makes a meaningful contribution to the locals and hence to conservation. You’ll see how the Himbas live and breathe in landscapes so big you will feel like the tiniest of insects in this vast landscape. 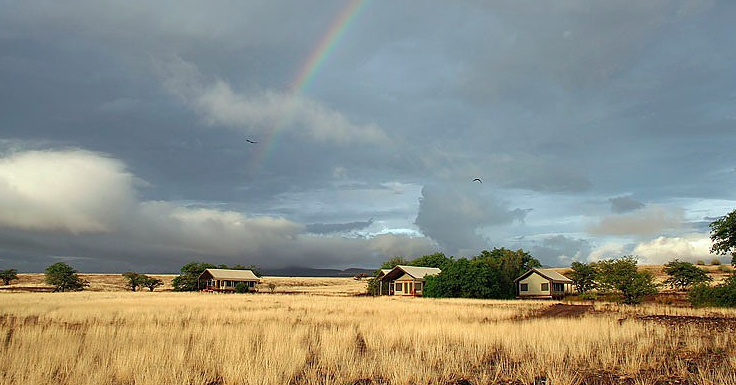 Serra Cafema camp also made the Top 50 in “Africa’s Finest” for its contribution to conservation. Finally on 27th May, we’ll all fly back to Windhoek and bid farewell. All meals and drinks are included in these safaris (with the one exception of the first night in Windhoek on the Namibian safari), all luxury accommodation, all park and community fees, two activities daily, internal flights between camps, laundry, and donations to relevant conservationists we spend time with. Travel insurance is compulsory and can be added separately. International flights to and from your home town are not included. Remember that the price also contributes to local conservation projects and keeps the wildlife and traditional communities you meet along the way afloat – so it’s really as good as a donation to charity. You’re also keeping my conservation work going, as my safari company is what pays the bills and allows me to do my conservation work for free. Group size is limited to 12 people and this trip is currently half full. Family groups are welcome. Please get in touch with me now if you’d like to sign up for this amazing adventure! Where should you go on safari in Africa? 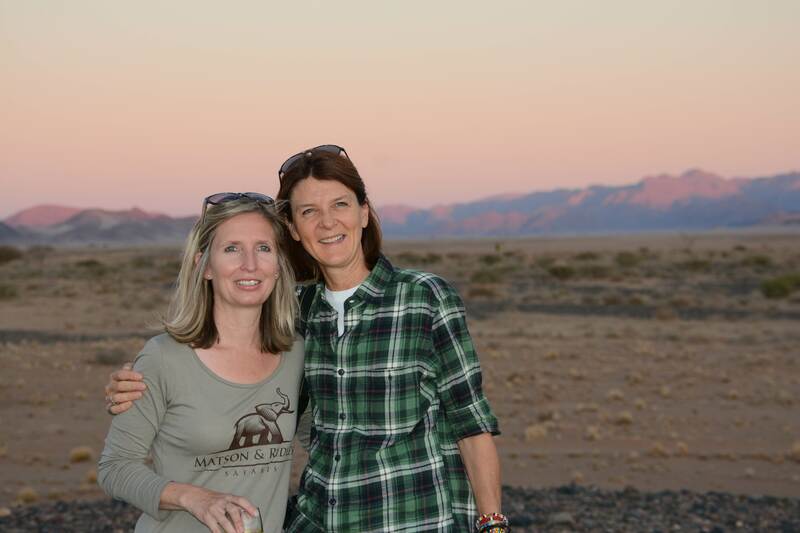 The choices seem bamboozling at first – Kenya, Tanzania, Zimbabwe, Botswana, South Africa… All are amazing and have their own unique angles and experiences, but I’m going to share a few reasons why I think you should consider one of my favourite safari destinations – Namibia. If my photos below don’t convince you, consider these five reasons why Namibia should be on your bucket list. 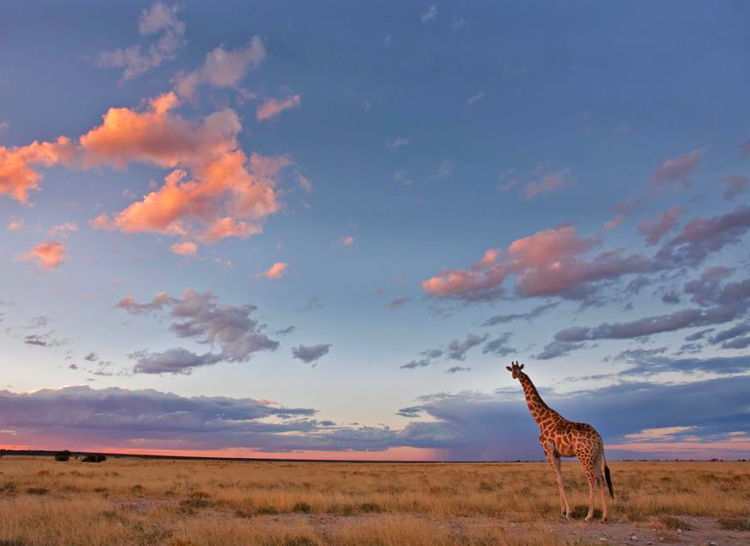 Namibia is one of the safest countries you can go on an African safari. A whole lot of people don’t realise that there are less safe countries to visit in Africa (Nigeria, Congo and parts of West Africa spring to mind) and there are much safer countries, like Namibia. In my opinion, the two safest places to travel in Africa are Namibia and Botswana, partly because of their low human populations, and secondly because you don’t get the same kind of crime that you get in some other countries (like South Africa). 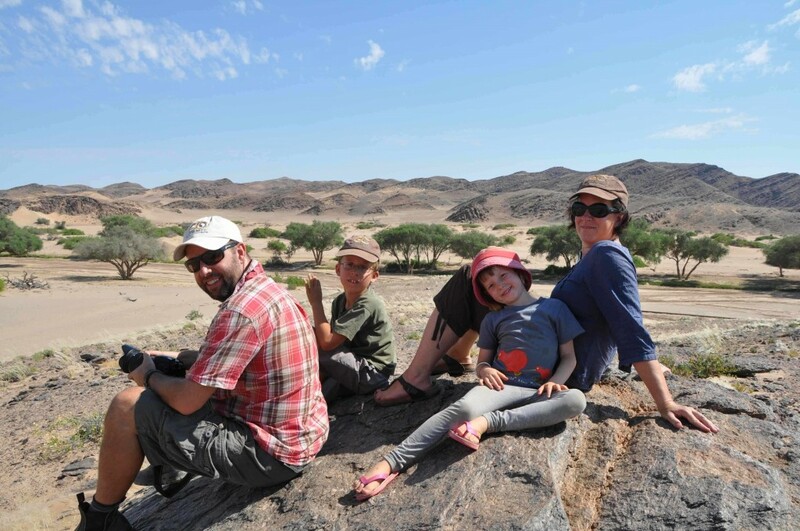 Namibia is fabulous for families and first timers to Africa. We always used to call it “Africa For Beginners”. Lots of people do self drive safaris there because the roads are good and the scenery is spectacular. Desert elephants in Namibia. These are savannah elephants with special adaptations to life in the desert. Most of us live in a world that is full of people living in close proximity to each other. We are constantly bombarded with commercialism and consumerism, bright lights, loud noises, all those things that are part of capitalistic life in the modern world. 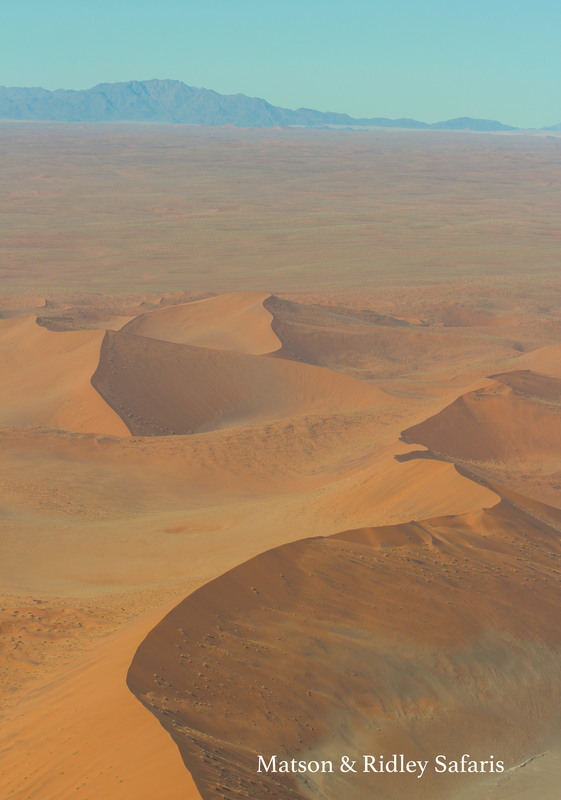 Namibia’s desert is the opposite of all that. There’s something about being miles from anyone else, enveloped by vast spaces and enormous skies, that provides a unique kind of escapism. For me, it’s a place I can breathe. More than half of Namibia is under conservation protection. I mean, think about that. It’s amazing. Australia’s only got about 12% under protection. It’s not all national parks in that 50%+ under protection in Namibia, although at almost 20% in national parks that’s a big chunk too. The key is all the communal conservancies managed and legally run by the local ethnic groups. 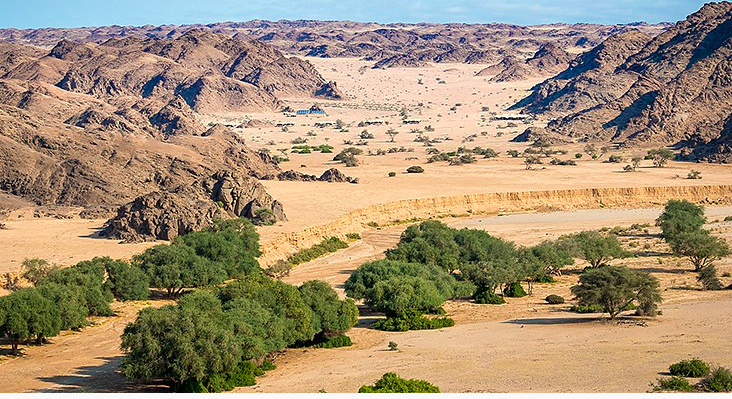 Namibia is one of the finest examples of community-based conservation you’ll find on the planet and tourism is a big part of that success story. In Namibia they’ve really got their head around giving local communities benefits from the wildlife, and that translates back to their excellent conservation record. 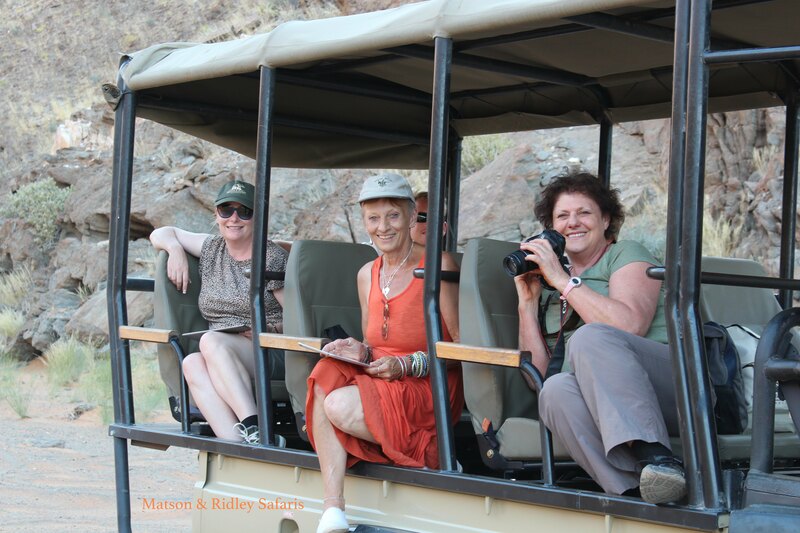 If you book an ethical safari through Matson & Ridley Safaris, you’re directly contributing to this conservation success. 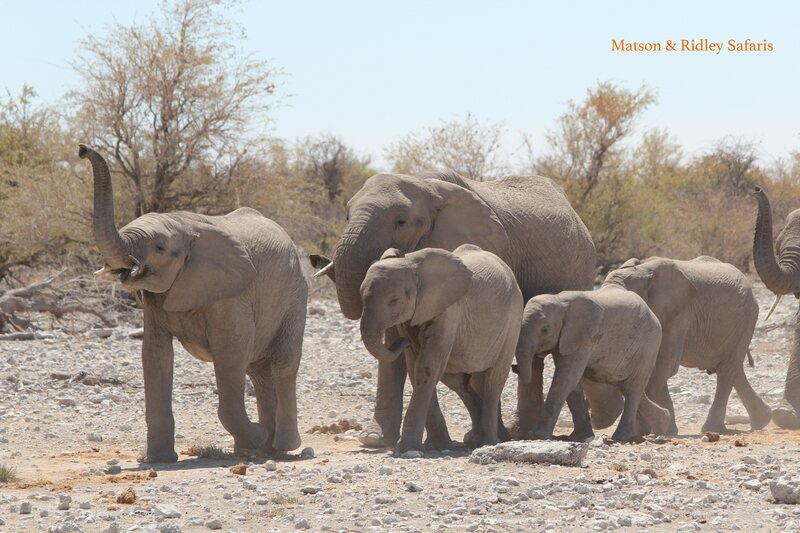 Read more about Namibia’s community-based conservation at the website of the Namibia Nature Foundation. 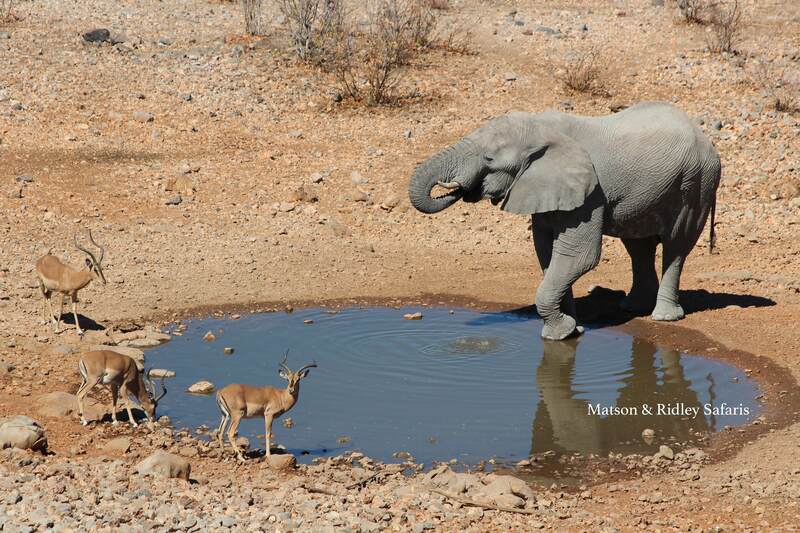 The safari experience you get in Namibia is like no other. 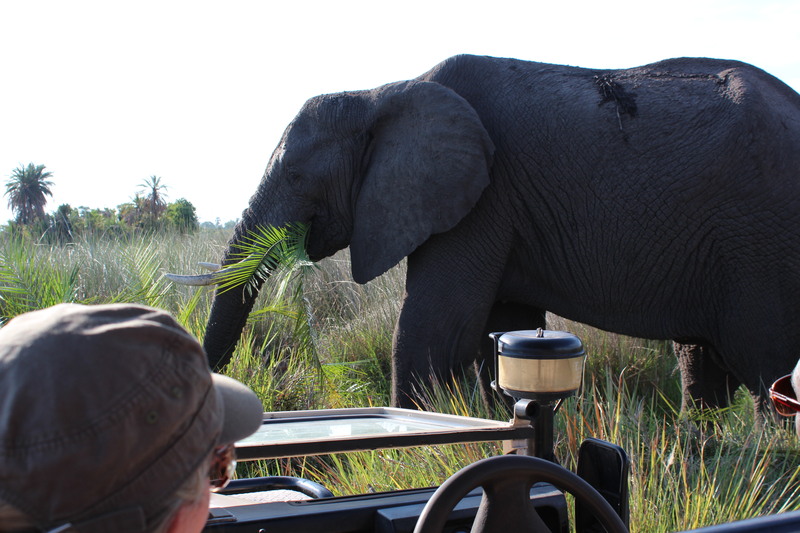 You won’t get all of the ‘Big Five’ (lion, leopard, buffalo, elephant, rhino) on your first game drive. Namibia’s about quality, not quantity. 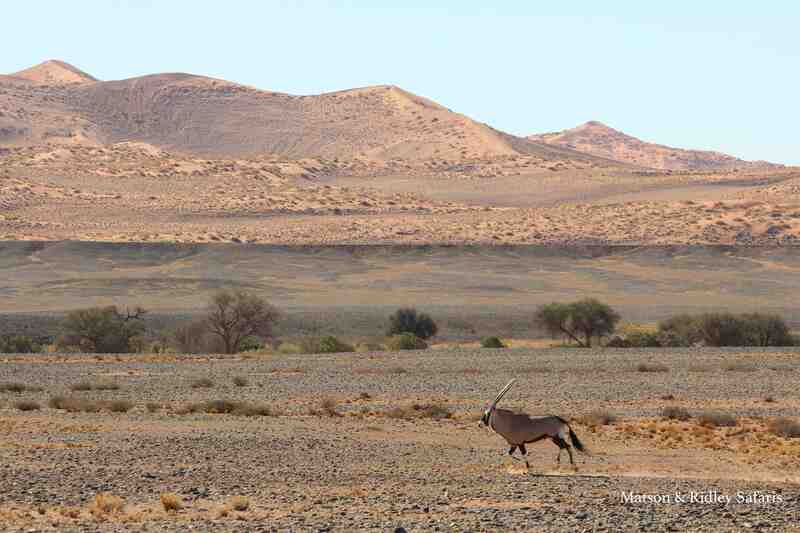 What you will get is a single, regal, solitary oryx antelope standing on the desert dunes at sunset. You’ll get tall, white elephants in Etosha (in the dry season), coloured that way because of the white dust flung off the enormous pan. You’ll get tiny lizards that dance to stop their feet overheating on the boiling hot sand, and desert beetles with tiny ridges on their backs that trap the moisture from fog rolling in from the coast by standing into the wind on a ridge of sand. What you get there is unique desert-adapted wildlife in huge landscapes that even dwarf elephants. 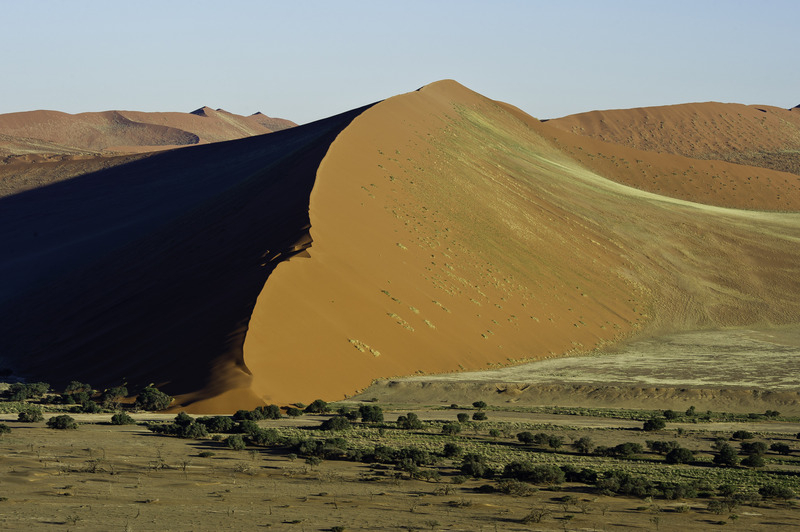 On a single safari, you can experience the sandy orange dunes in the Namib Desert, the red, rocky volcanic landscapes of Damaraland in the north west, thorny bush lands and of course the famous Etosha salt pan fringed by short grasslands. In the north east you get big flowing rivers and in Bushmanland you get ancient, towering baobab trees. It’s incredibly diverse. You do have to cover a bit of distance as it’s a big country, but your money goes a long way in Namibia. 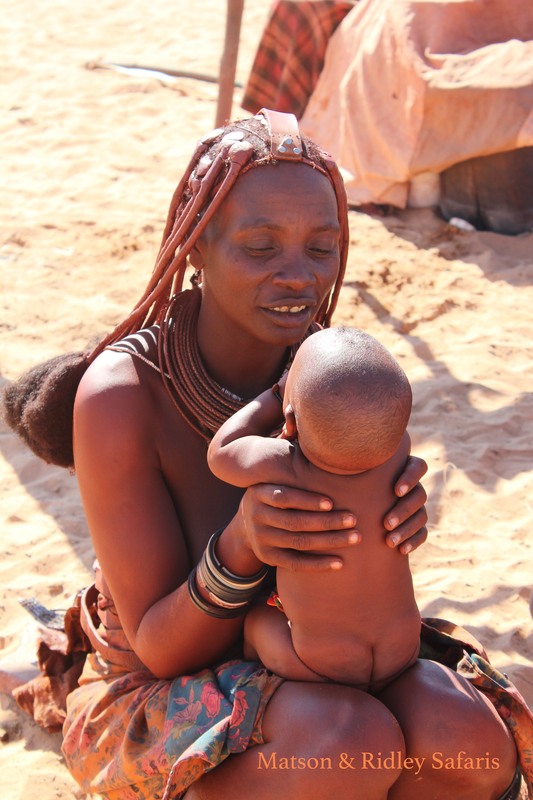 There are also at least 11 ethnic groups in Namibia, from the traditional ovaHimba people to the cattle-focused Hereros and the San Bushmen. I’ve got a few places left on my north west Namibia safari in May 2016, and only 1 spot for a single male for this year’s Namibian safari in September, so get in touch if you’d like to experience this amazing part of Africa with me. 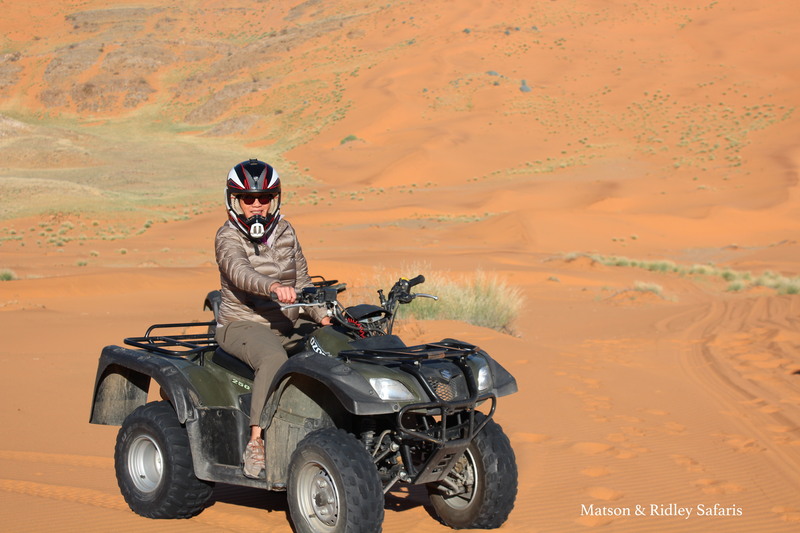 Alternatively, drop me a line if you’d like to book your own self-drive or fly-in safari in Namibia and I’ll plan an itinerary for you and your family that gives you your dream safari while making a difference in conservation. Namibia’s worth it, trust me! I’m a massive fan of hyaenas. They’re comical, cheeky and downright cute if you look at them from the right angle. One person who agrees with me is Dr Martina Trinkel, who was studying spotted hyaenas in Etosha National Park when I was studying black-faced impalas for my PhD many years ago. We both lived at the research camp at Okaukeujo, but for my first six months I barely knew her, as being a researcher of a nocturnal predator, she would go out at sunset to look for hyaenas just as I was coming back for a good night sleep after a day of studying impalas. I would see her return home in the early hours of the morning, just as I was heading out. You’ve got to be dedicated to be a predator researcher, out all night in the desert cold, patiently seeking elusive animals in the dark, but as this interview with Martina shows, she developed a huge respect for the hyaenas we all know and love from ‘The Lion King’. Africa’s a big place. Actually, really big. You can fit all of China, India and much of Europe into it’s vast landscape. So when you’re planning to go on safari, where do you start? And once you’ve been once, and you’ve got the Africa bug, where do you go next? 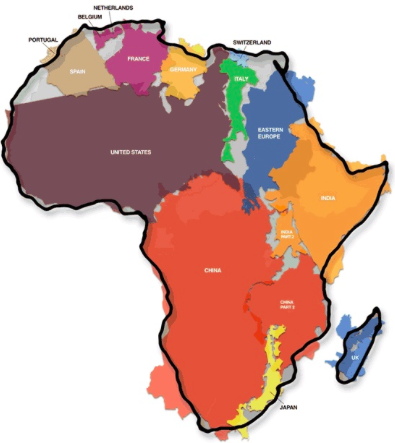 Africa is a big place! So what’s your favourite safari destination? It’s a tough question, because they all have their merits. In this blog I’m going to have a crack at sharing my current top 5 safari destinations and let you make up your mind where’s best for you to live out your dream. It’s not just that the Okavango is literally teeming with wildlife in the most beautiful palm tree lined wetlands you can imagine, it’s that Botswana itself is such a wonderful conservation success story. With strong and stable political leadership, a healthy economy and 45% of the population being employed in tourism, it’s no wonder this land-locked country at the centre of southern Africa is doing so well at conserving its wildlife. The human population is only about 2 million and most of the country is classified as desert, so you don’t get the human pressures that you get in other more highly populated African nations (violent crime being one of them). You’ll see all sorts of interesting critters in Botswana, including all the big cats, African wild dogs, the sitatunga, a wetland dwelling antelope I have yet to feast my eyes on, and the largest elephant population in the world. 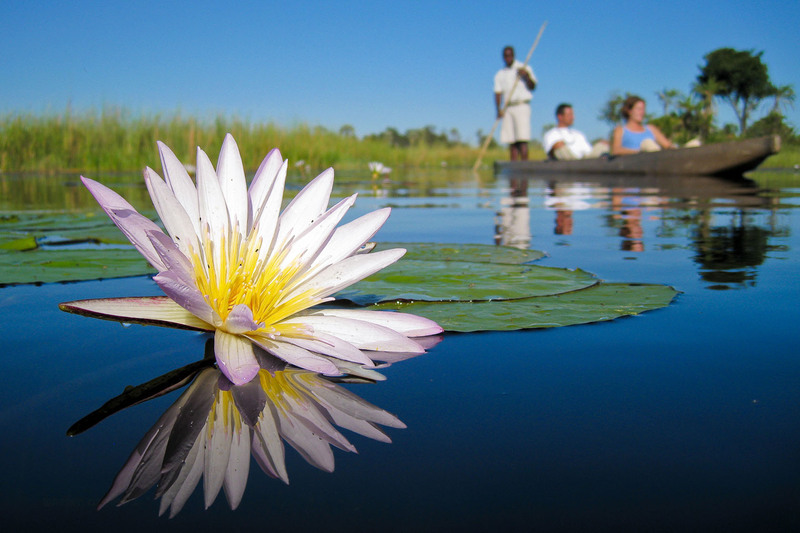 Besides that, who wouldn’t want to explore nature in a mokoro? 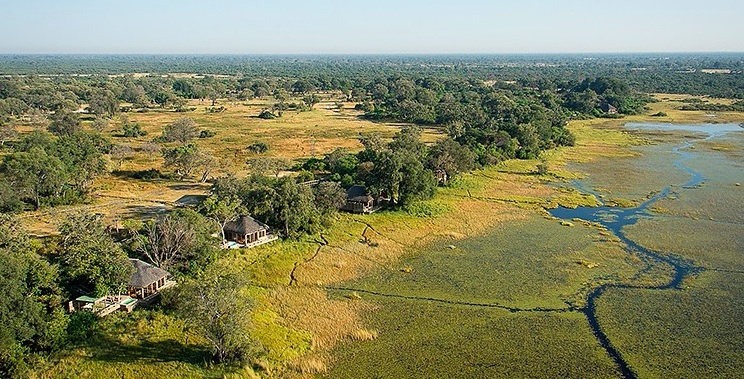 Suggested Camps: Chitabe (for predators galore), Xigera (for wetlands, mokoros & sitatungas), Vumburra Plains (for pure luxury in my kind of heaven). This choice might surprise you. Zimbabwe is where I started my African journey back in 1993 on a safari with my Dad at the age of 15 in the Save Valley Conservancy, and it’s still a special place to me. 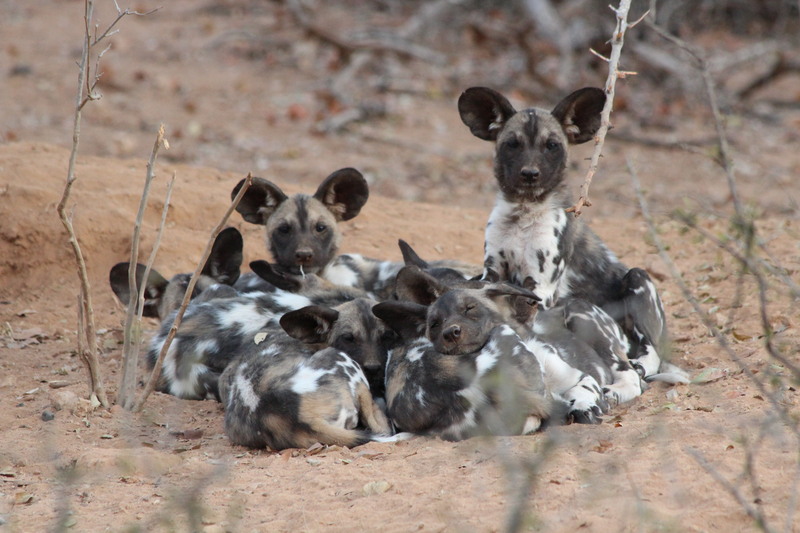 The Save Valley Conservancy remains one of the best places in Africa to see rare African wild dogs. If you go during June, July, August, you’ve got a very good chance of seeing pups at dens, and that is just the cutest thing ever. If you arrange to visit through me, you can also meet the team running the rhino anti-poaching operation, Bryce and Lara, and the Turgwe Hippo Trust‘s Karen Paolillo, who has been studying the area’s hippos for decades. 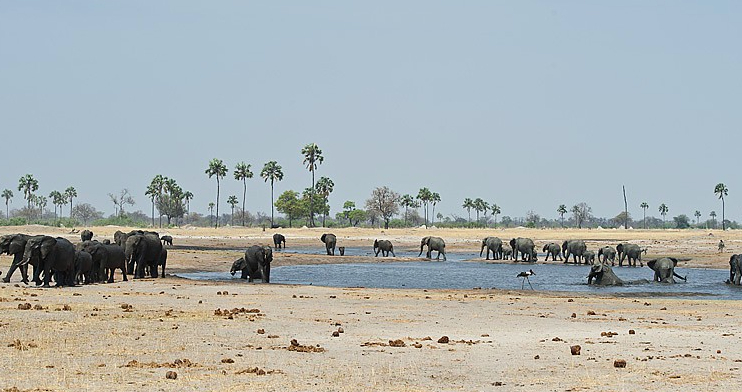 I also love Hwange National Park. 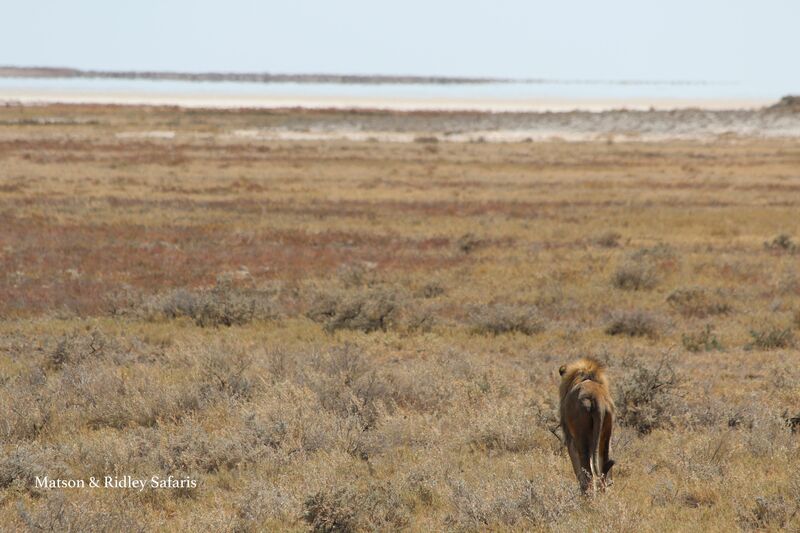 It feels like old Africa to me, and the wildlife there, especially in the dry season (June-Oct), is spectacular. I’ve had lions walk right beside the open vehicle in Hwange, and elephants in their hundreds lining up at waterholes. The thing about Zimbabwe is that many people aren’t traveling there because of the political instability brought about by the current regime. But I’ve been traveling there with my family in the last five years without any troubles, and the people are as friendly and welcoming as ever. And of course, on the border of Zimbabwe and Zambia is the famous Victoria Falls, which you have to see at least once in your life to have your breath literally taken out of you. I only recently ventured into East Africa, having spent the last couple of decades exploring what southern Africa has to offer, and man, was I blown away by Kenya! They’ve been doing safaris in style there for a long time, and it shows in the quality of the experiences they can offer. 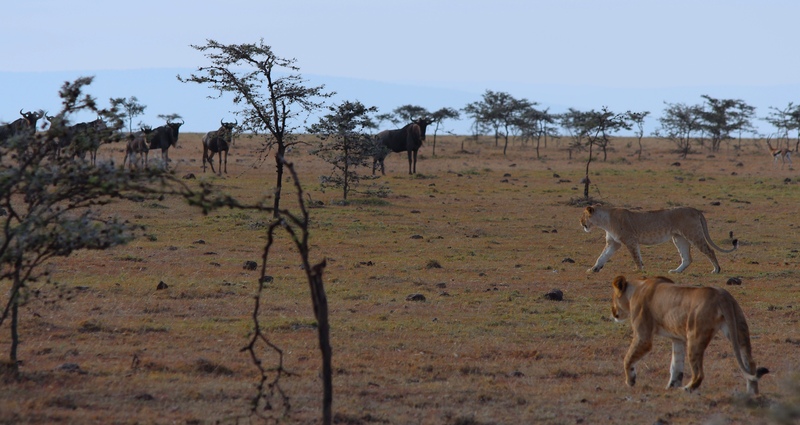 One very good reason to go to Kenya is that it has the famous great wildebeest migration in the Masai Mara. You have to time this carefully to make sure you’re in the right place at the right time. I am taking a group of up to 12 to Kenya in July next year (safari details here) and there are still spots available for now, but please don’t wait to register your interest as my other two trips to Namibia and Botswana sold out in record time!). When I got off the plane at Ol Donyo in the Chyulu Hills, nestled between Amboseli and Tsavo National Parks, I looked across the vast grass plains and up to the gobsmacking sight of Mount Kilimanjaro, and I was speechless. 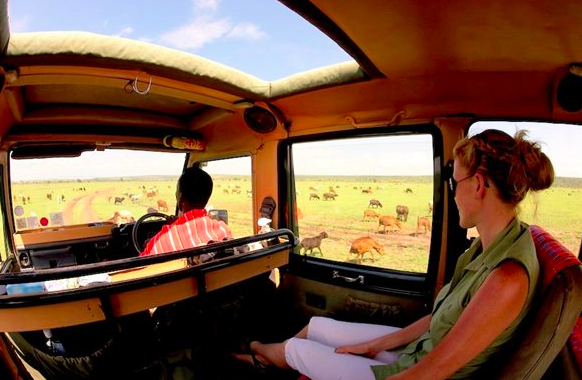 The key with traveling in Kenya is to avoid the crowds of minibuses and go with a good operator that offers you exclusivity with the wildlife. 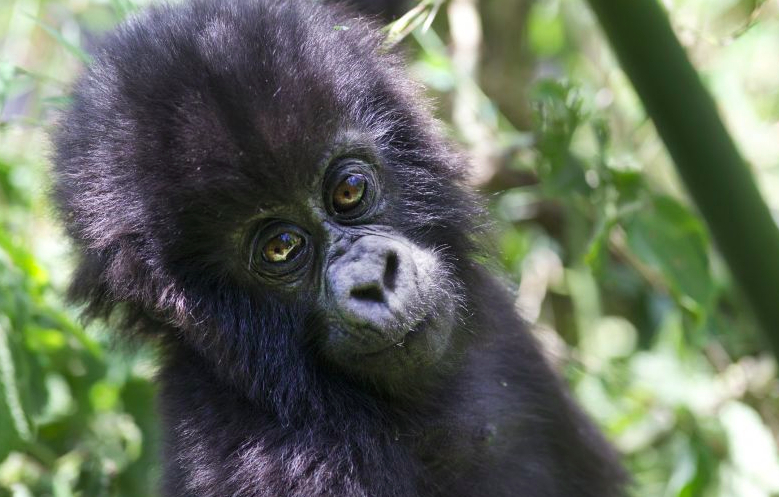 And as always, I suggest staying at lodges that operate in partnerships with local communities and conservation organisations, so you know your tourism dollars are helping make a difference on the ground. Kenya is also the home of Daphne Sheldrick’s famous elephant orphanage, a truly special experience that has brought many tears to the eyes of those who visit. Having lived in Namibia for six years, studying black-faced impalas and later working on human-elephant conflict, I’ve still got a soft spot for this vast desert land. You won’t get a sense of space like this anywhere else in the world. The silence in the Namib desert can be overwhelming when you live in a noisy city, and can actually take a bit of adjusting to! 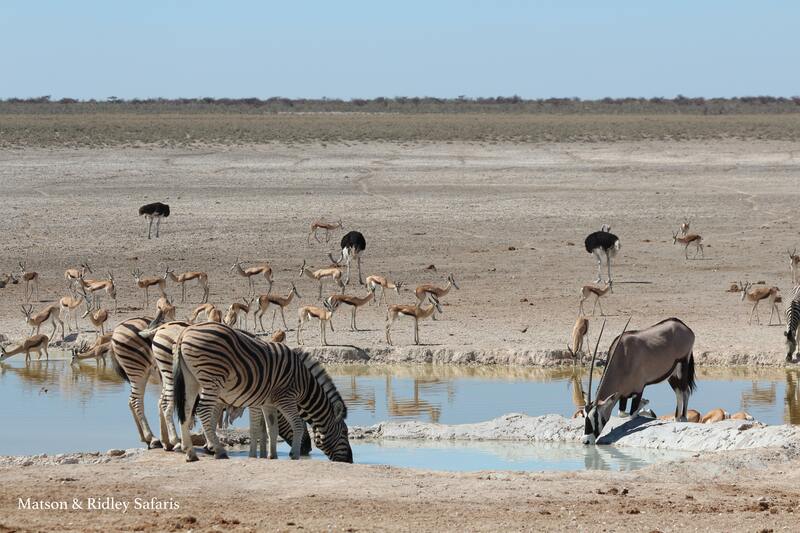 Spotting unique desert creatures like oryxes, springboks and ostriches on the desert plains is one of the best things about being in Namibia, as is seeing the vast congregations of animals at waterholes during the dry season (July-October). Etosha National Park is famous for its white elephants (coated in white dust from the Etosha salt pan) and is one of the best places in Africa to see black rhinos. 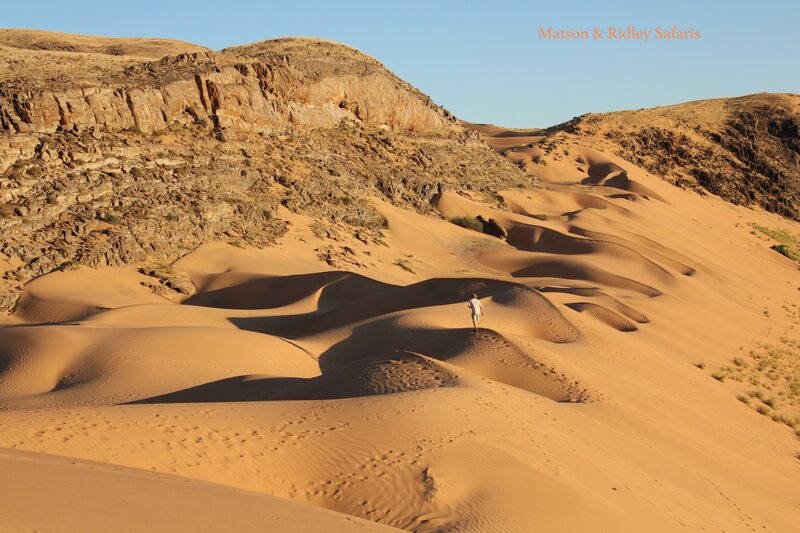 I also love the north west of Namibia, the Skeleton Coast and Damaraland, where you get desert adapted lions and elephants eking out an existence alongside traditional ethnic groups like the ovaHimbas. My absolute favourite camp in Namibia? Serra Cafema, for sure. Up on the border with Angola, right at the top of Namibia, on the Kunene River, it’s the most remote camp in Africa and going there is like going to the moon (in a very good way!). 5. Okay so now I’m up to number five, and of course, this is not easy, as there are lots of other great options for safaris that I’d like to include here, like South Luangwa National Park in Zambia (real wild Africa with tonnes of elephants) and even some I haven’t been to that I really want to see, like Ethiopia, Tanzania and Mozambique, but I think the final choice for this blog, based on what I’ve seen to date, has to be Kruger National Park, South Africa. 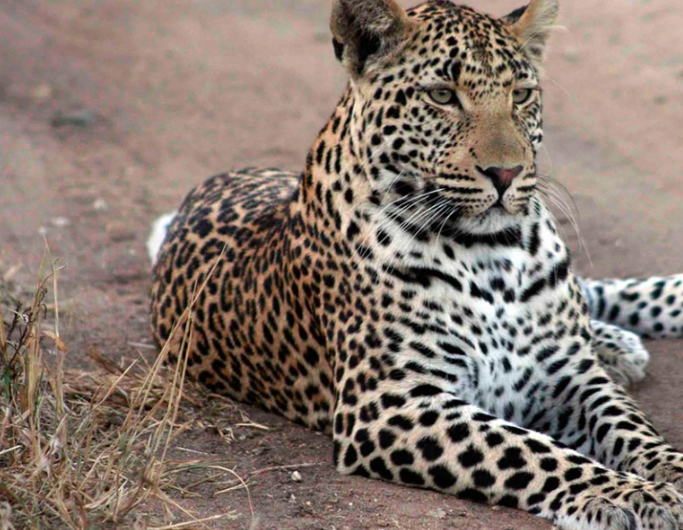 There’s really no other national park like Kruger for an awesome ‘big five’ experience. But it’s the private reserves on the edge of the park that you want to stay in. South Africa offers so many luxurious and mid range options for families, couples or groups, that it’s hard to know where to start. You’ll get a lot for less price in South Africa because there’s a lot of competition and very high standards of accommodation. It’s a great starting point for a first safari, especially for families as they specialise in this. At Tinstwalo last year with then 3 year old Solo, we saw the entire big five, including an incredible leopard sighting and mating lions, in 36 hours! There are excellent malaria-free reserves in South Africa too, guides that specialise in giving kids an amazing learning experience, and you can always add on a few days exploring Capetown and the magnificent mountains and wineries of the region. 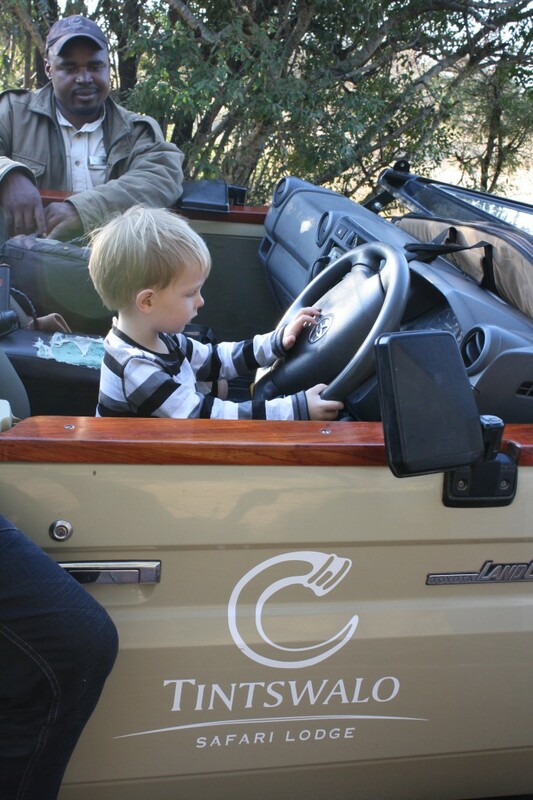 Solo (then aged 3) got to pretend to drive the Land Cruiser while on safari at Tintswalo, South Africa, which was definitely a highlight of the trip for him.